The Best Western Bidarka Inn is ideally located in the center of Homer. Come and experience our hotel near the major tourist attractions. Best price guaranteed and exclusive deals. Come stay with us when you’re in beautiful Homer, Alaska. Take a seat and soak in some of the colorful Alaska culture. Coffee is available in the lobby. 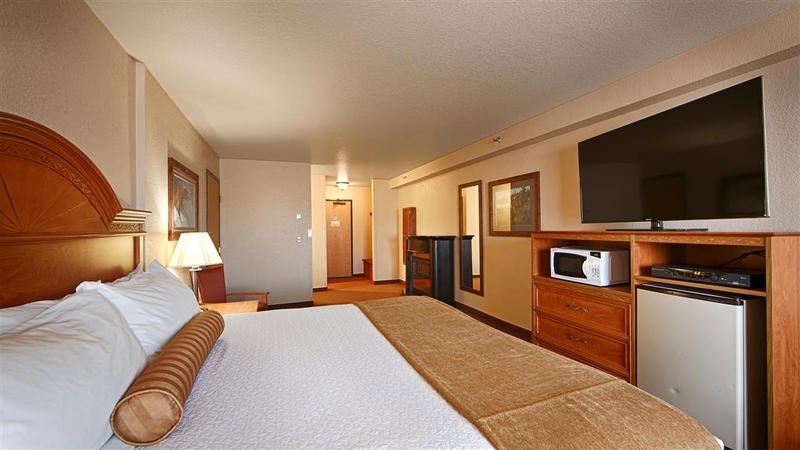 All of our guest rooms include 32-inch flat screen TVs. Our rooms are perfect for getting a good night’s sleep after a long day of work or play. Every one of our beds has a pillowtop mattress. We take pride in making sure everything is in great shape for each guest. There’s no better place to stay in Homer, Alaska. A guest freezer is available if you need a place to store the fish you caught! Alarm clocks and wake–up calls are available to help you get going in the morning. Come stay with us at the BEST WESTERN Bidarka Inn. Bring the whole crew, we have rooms with 3 beds. The third bed in our 3 bedded rooms. Everyone will sleep comfortable in our large 3 bed rooms. Bring all of your out of town guests to the BEST WESTERN Bidarka Inn! You’re going to want to experience Homer with a group and we have the room for you! Our two beded room with a sofa sleeper. 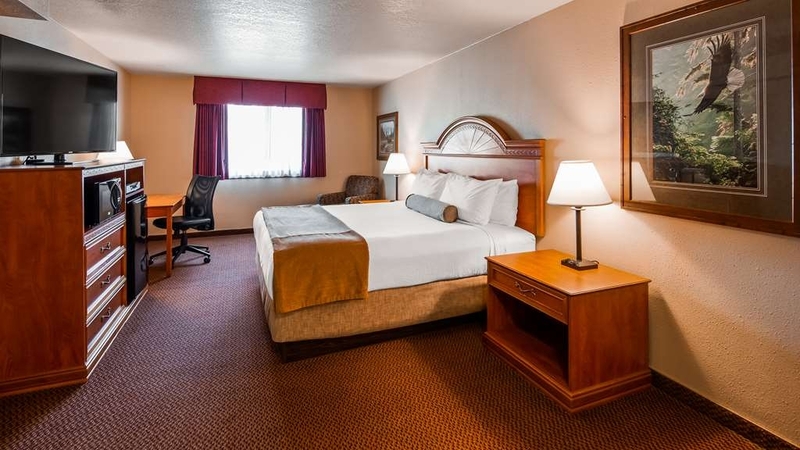 There’s plenty of room for the whole family in our large rooms. Every one of our rooms includes a complimentary breakfast in the morning. We have smoking and strictly non-smoking rooms. 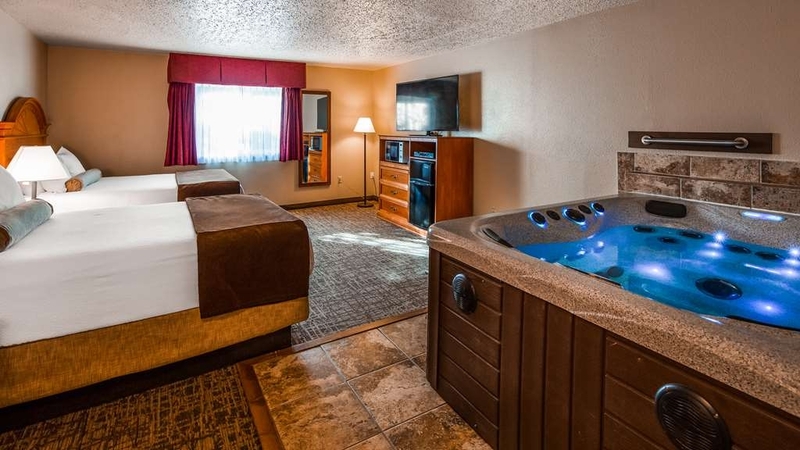 Treat yourself to a whirlpool room. Sleep tight knowing the beach is just a block away. 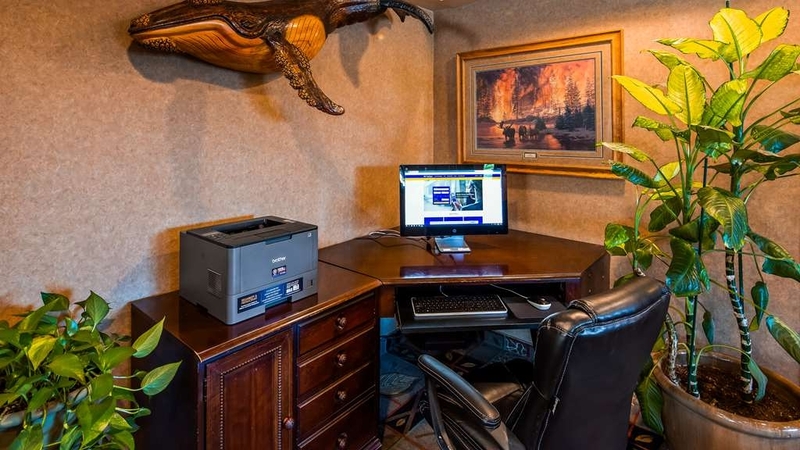 Desk areas are available if you need to get any work done on the road. 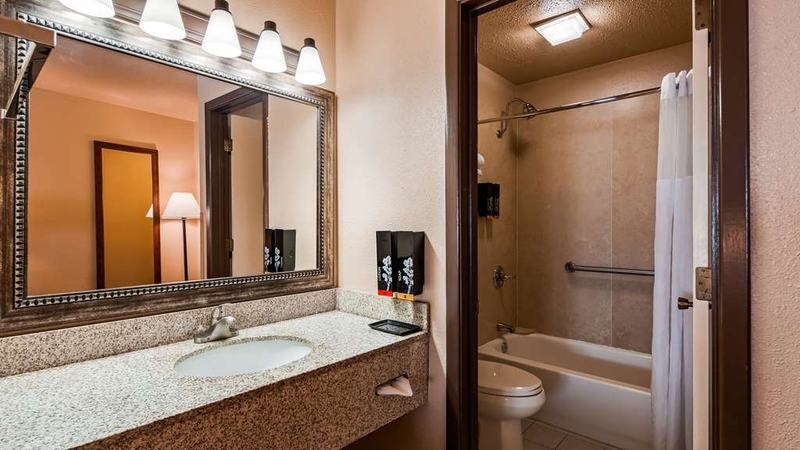 The whirlpool rooms are perfect for a weekend getaway. 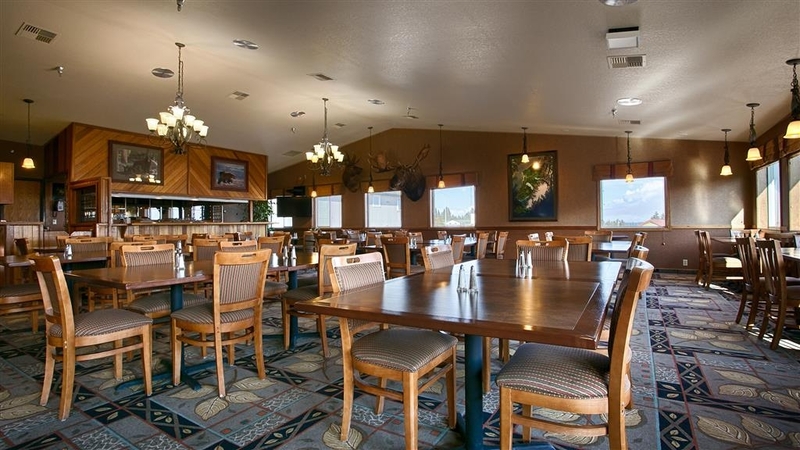 When you’re in Homer you won’t want to miss the BEST WESTERN Bidarka Inn. Irons and ironing boards are included with every room. All of our bathrooms include a hairdryer. Our breakfast features many hot and cold items. There’s plenty of space in our breakfast area. 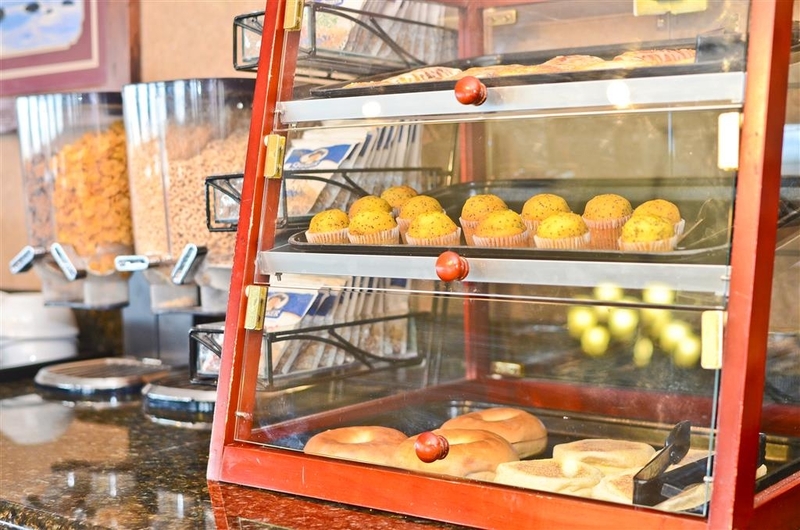 Start the day off right with a delicious complimentary breakfast. You won’t have to skip the most important meal of the day! Every room includes a complimentary breakfast. 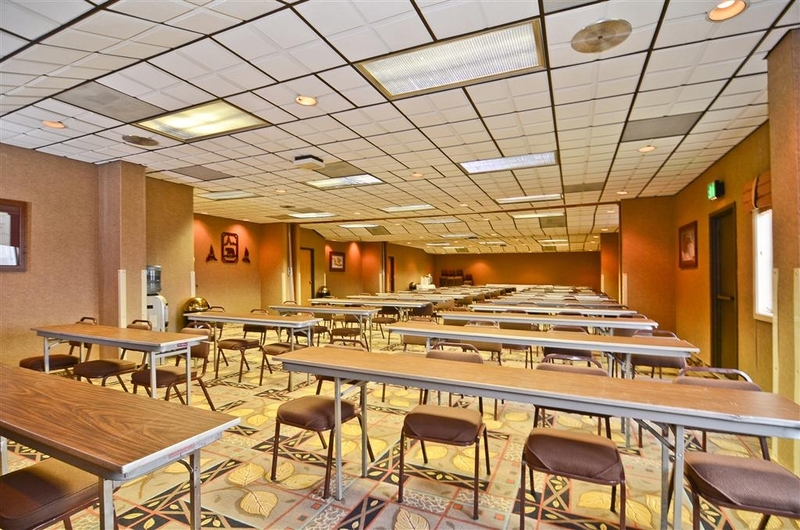 If you are looking for meeting space in Homer. check us out! 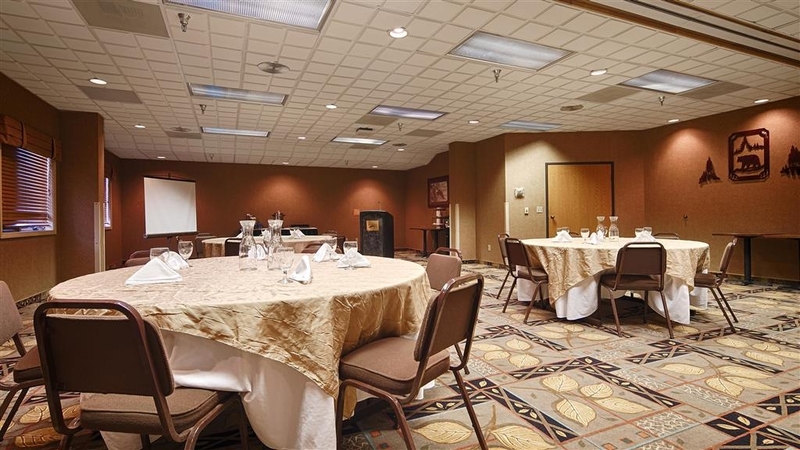 We can set up our meeting space to fit your needs. 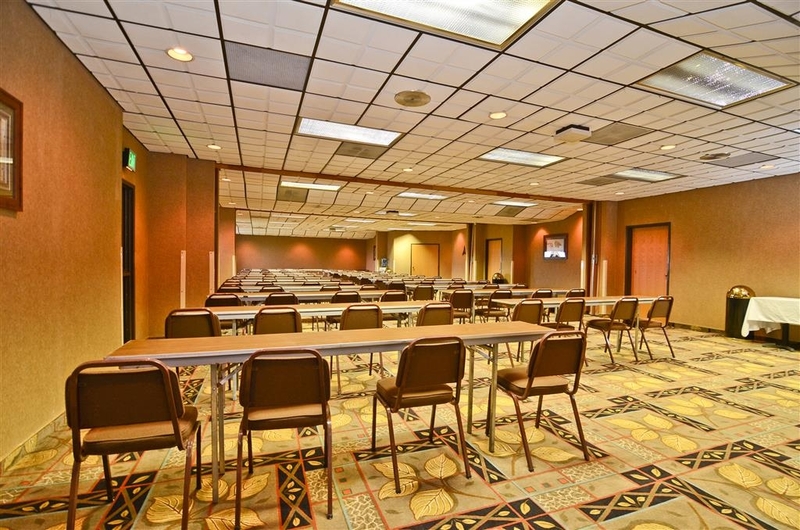 We have a large versatile meeting space. 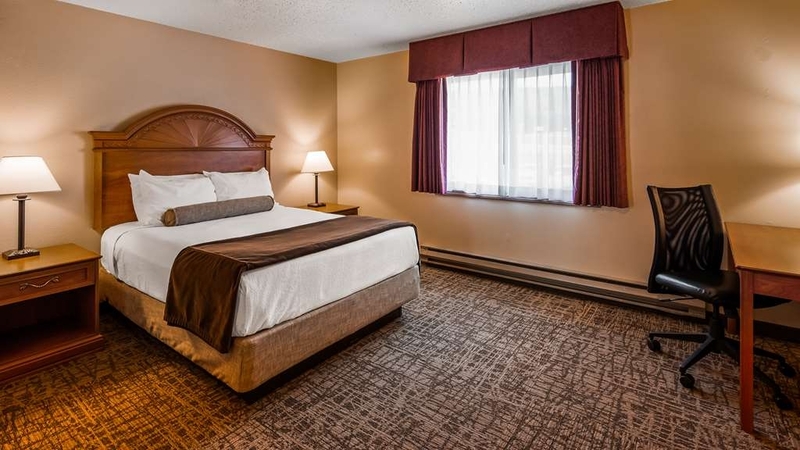 The Best Western Bidarka Inn, AAA-approved, full-service Homer, AK hotel is conveniently located near exciting downtown attractions, thrilling outdoor adventure, beautiful beaches and plenty of shopping. 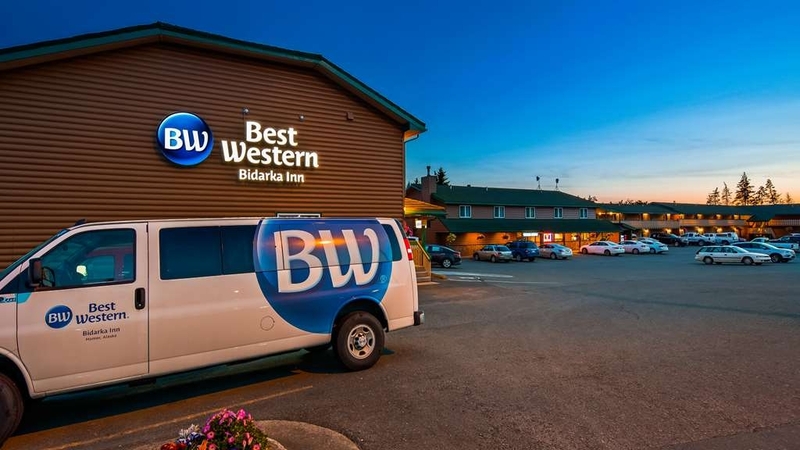 Plus, as the only brand-name hotel in Homer, AK, you know that the Best Western Bidarka Inn comes with the Best Western promise. Just outside the Best Western Bidarka Inn, guests will find themselves close to grandeur of the Kenai Mountains, the Alaska Range and Kachemak Bay State Park. Outdoor enthusiasts will love the amazing salmon and halibut fishing, water recreation, eco-tours and breathtaking scenery. Take a Bear Photo Safari, cruise the bay or hike the wilderness - the choice is yours at this Homer, AK hotel. Walking distance to downtown Homer, the Best Western Bidarka Inn is close to the area's best shopping, art galleries, restaurants and more. And with just a one-block walk, guests can experience the nearby beach. But while you're here, don't forget to see the four and a half mile Spit, Homer's famous landmark. 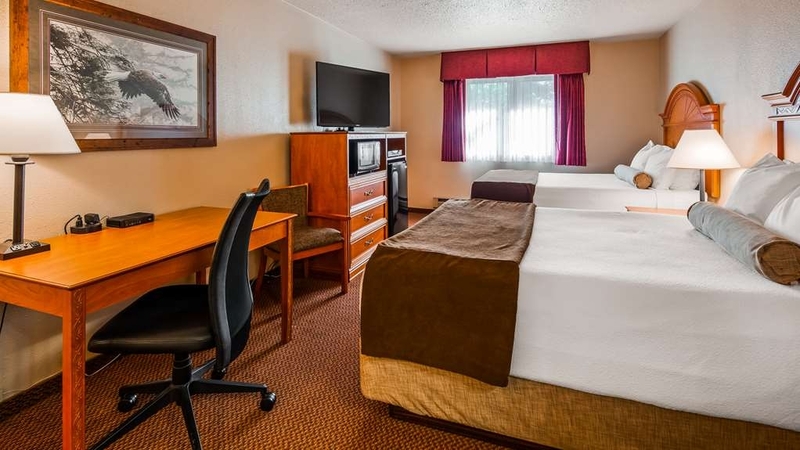 After a day of exploring, get cozy and comfortable inside the Best Western Bidarka Inn with well-appointed guest accommodations that feature all the comforts of home, including plush pillow top beds, 32" LCD TVs, a microwave, refrigerator and more. Other hotel amenities include a complimentary hot breakfast buffet each morning, free parking - there's plenty of room for buses, trucks and RVs - banquet facilities, high-speed Internet access, a cocktail lounge and full service restaurant. Business guests will also love being near popular businesses, hospitals, city and state government facilities and gas companies. For a great experience in Homer AK, book your stay at the Best Western Bidarka Inn and save today. Welcome to Best Western. The Bidarka Inn has been a nice stay for the price. The rooms are clean, the staff is friendly and it's perfectly located near my office in Homer. It isn't fancy, but always find it a comfortable stay. Decent hotel. Good breakfast, but it was chilly in the breakfast room. Hotel bar had good selection, prices and service. The lady working the breakfast was very friendly and the made to order omelette was very good. "Dated property, non-responsive service and no security "
Stayed one night in January. Property is dated. Rooms feel a bit like walking back into the 70's. Operable but definitely dated. Check in service was friendly enough. At 3 AM when either a party or an argument woke us and kept us awake for nearly an hour, complaints appeared to go ignored. One bright spot, breakfast. Nice selection and the host was warm and welcoming. Thank you for staying with us. I would appreciate some feedback on what you thought was dated. We have been through lots of remodeling of our rooms in the last 3 years so any feel of what made you think we are dated would be appreciated. I am sorry some rude guests woke you up. I checked the log book and talked with staff who were on at the time and no disturbances were reported. If you have an issue please contact the front desk. We have protocol in place to deal with these unfortunate situations. Again sorry for the inconvenience and hopefully you will give us another chance to make your stay an enjoyable one! Thank you for staying with us. We have since painted our rooms and replaced a piece of equipment in our breakfast area that could have contributed to some items being luke warm. We are glad you had a good nights sleep and look forward to seeing you upon your return. 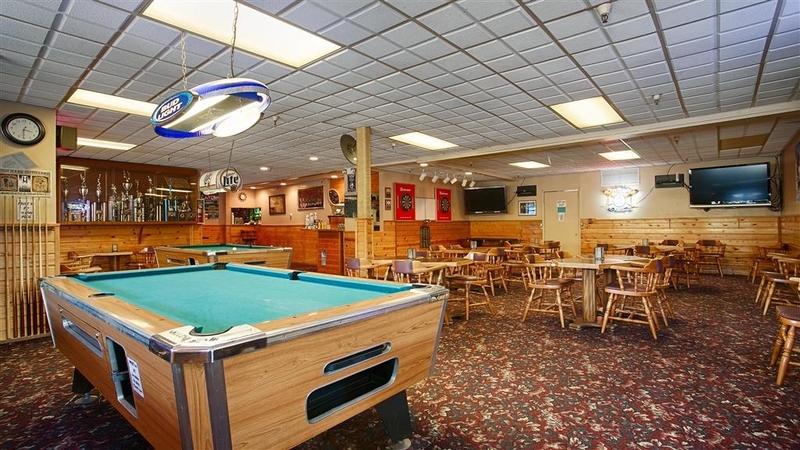 "Good Location, Nice Bar and Restaurant"
Great place to stay when visiting Homer. Located close to the fishing docks. Has a bar and a restaurant. Close to shopping. Rooms were ok, comfy bed, fairly clean. It's a Best Western, not a Hyatt or Marriott. Thanks for staying with us. We look forward to seeing you again on your next visit to Homer. "nice room and had a good night sleep"
We stayed in the extra Buliding - rooms are nice and clean - compfy beds and thankfully quiet as well. Internet doesnt work very well in this building. rooms could be more modern for a Best Western. Breakfast was faboulus - omlettes made for your liking. Never had that before in a Motel. Thanks for that. Thank you for staying with us. We had an internet switch go bad in that building. We received the replacement parts and have it back up to normal. I am sorry for any inconvenience this caused you. We look forward to seeing you again upon your return to Homer! The internet is not very fast but I slept like a rock and for breakfast the head Chef cooked the best omelette I have had in years. He is very talented that omelette was perfectly put together and cooked. Thank you for staying with us at the Best Western Bidarka Inn. We look forward to seeing you on a return visit. 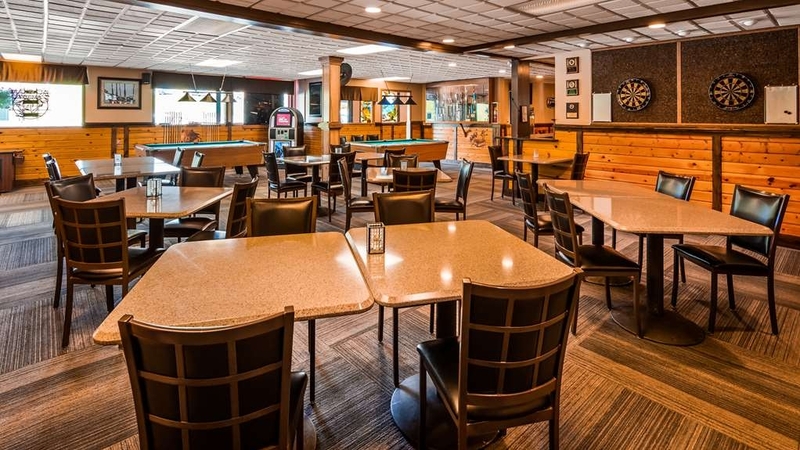 "Very Comfortable and a fun bar!" Bidarka Inn is in a very small town with quite a few hotels/motels. Rooms are large, clean, comfortable. No one has pillows like mine at home, but that's beside the point. Very nice, welcoming staff. And a fun bar with snacks as well as alcohol, and a friendly bartender! Thank you for Staying with us at the Best Western Bidarka Inn. Homer is a very small laid back coastal town. I am glad that you were able to enjoy that atmosphere. We look forward to seeing you on your return to Homer. Have a wonderful day! "A Huge Room and a Great Breakfast"
Thank you for staying with us at the Best Western Bidarka Inn. 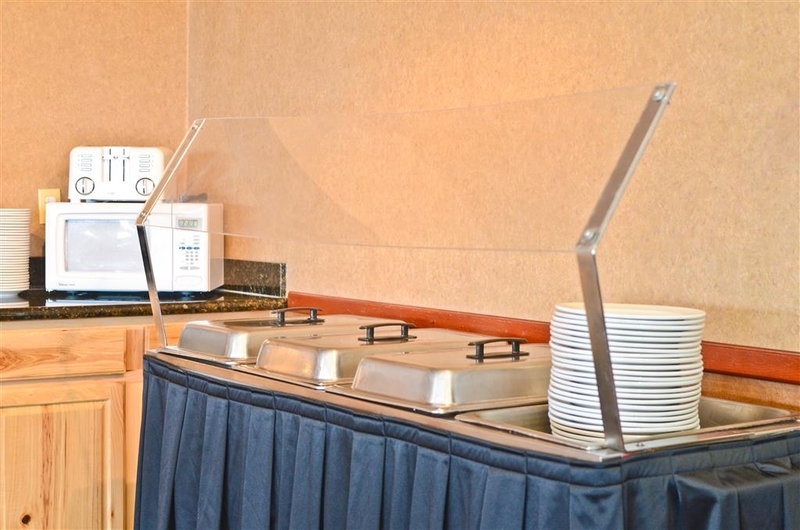 The omelet station is a new addition to our complimentary breakfast. 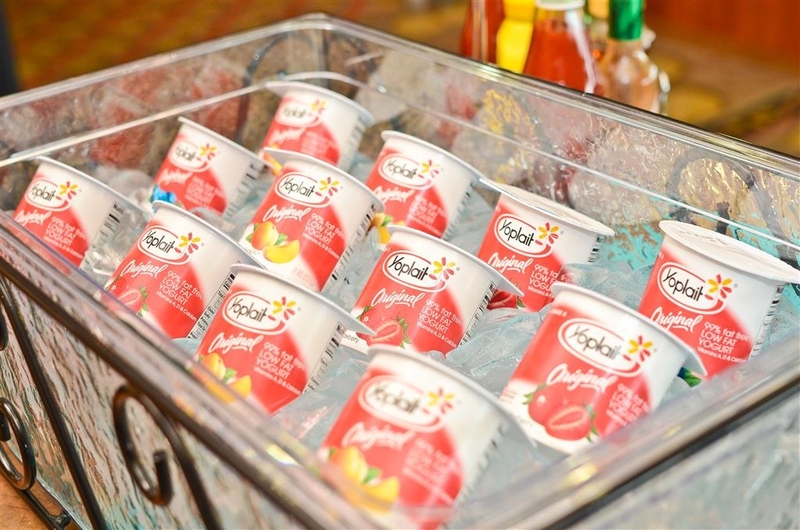 This as well as a parfait station has been well received and been made a year round addition to our breakfast. Thanks again for choosing us. "When in Homer, stay and eat elsewhere"
If you stay overnight in Homer, Alaska, as we did on our vacation last month, the Best Western Bidarka Inn is far from the best choice. In fact, the place is little more than a roadside motel with a faux log-cabin exterior and the worst complimentary breakfast I've ever had. Our room had two electric radiators, but the smaller one in the bathroom didn't work. The two queen beds were much too soft, and the floor between them sloped down toward the wall. The TV remote barely worked, and buttons had to be pushed two or three times to change a channel or perform another function. As if that wasn't bad enough, the next day's free buffet breakfast didn't offer cut-up fresh fruit, nuts or raisins for the granola or egg whites for the mediocre made-to-order omelet, and the coffee was dispensed by a machine. When I checked out the next day, the woman at the front desk said she'd make a note of our problems so the "next guest" wouldn't experience them. I also was annoyed to find she had quoted the room rate over the phone without including the tax. We paid $233.16 for the awful room. At breakfast, the harried cook preparing the made-to-order omelets in the dining room told me he couldn't take my order because he was cooking someone else's omelet. That could be easily remedied by having forms guests fill out indicating what kind of omelet they wanted, the practice at the Hyatt House in Anchorage. I am sorry you did not enjoy your stay. We had implemented the omelete station in early summer. We did make changes from input from our guests. We also do not offer cut fruit but we do have 2 fresh fruits available for our guests along with many other options including oatmeal, waffle and parfait station. If you have a problem with your room we would love to know about it at the time you find the problem so we can address the issue immediately. Again, sorry you did not enjoy your stay but I hope you will have a nice day! Our room was very generous and complete. however, the bar/restaurant at this place was crowed in evening at eating time. There was only one girl to take care of all the bar and cafe customers. As we were sitting down to order, 3 customers (almost customers) chewed her out, stormed out with "If this is how you treat locals, we will never come back." Most people would have been crushed but she handled his rudeness beautifully. Breakfast was very good. In short, I think that the management of their restaurant is severely short-sighted and turned an otherwise visit a little sour. A "good"==Dave, who drove us to airport is a very interesting individual! I am sorry for the inconvenience of a busy restaurant. We strive to have ample staff to handle a busy night. This did not happen and I apologize. I want to thank you for your feedback. We will use this to make improvements in the future. "Alaska Vacation - Best Western stay"
While in Alaska for 11 days touring the Kenia Peninsula, we stayed at several Best Western Inns. All our reservations were chosen by reviewing online reviews. We found each Best Western we stayed at very clean, safe, and comfortable. The beds are wonderful. The Bidarka Inn has a great full breakfast with an omlet station, and the lounge is very nice and friendly atmosphere. Thank you for staying with us at the Best Western Bidarka Inn. I am glad that you enjoyed your stay. We look forward to seeing you again on a return visit to Homer. We checked in yesterday and pleased with the friendly staff and accommodations. Only thing was no air conditioning, slept with window open & fan but was still hot. Disappointed with the breakfast, was told they would have bacon but was sausage and the omelette that I was excited to have was made on spot was over cooked. All in all was nice place to stay!!!! ?? I am glad you enjoyed your stay. I am sorry about the sausage being served instead of bacon. We rotate breakfast meats so that there is not the same thing everyday. We also rotate toppings for our waffle, yogurt parfait and oatmeal stations. We are glad you were here for some warm weather. We only get a couple weeks of warm weather a year. We are looking into a/c units for next year and hope to have them installed for the 2019 summer season. Have a nice day! "A fantastic time in Homer, Alaska"
Eight of us stayed at the Best Western. Their rooms were clean and in good repair. I would describe them as perfect but dated. However, being in some small fishing villages and or sporting areas in Alaska we had no trouble accepting this and it added to the ambience. I would highly recommend anyone staying at the Best Western. The people were friendly, helpful and together helped to make our trip very memorable. Thank you for staying with us at the Best Western Bidarka Inn. "Perfect for a short stay in Homer!" The staff was very friendly! Room was very clean! Even had a partial view of water and mountains from our second story window. Breakfast was great! The Chef EVEN better! I am vegan and he prepared a special plate, with special utensils and a pan just for vegan food! Close to downtown and not too far from the Spit. We were only one night in Homer after driving from an overnight flight from LAX to Anchorage. The hotel worked out great for us! The price was right for a quick stay! Thank you for choosing the Best Western Bidarka Inn. I am glad you enjoyed your short visit to Homer and we look forward to serving you on your next adventure. Enjoyed staying here for a couple of nights, quiet, comfortable beds, free WiFi and breakfast included, seemed like a very nice family friendly place to stay. The Otter Room had pinball machines and pool table with a nice bar and restaurant. The Homer Trolley stops right at the hotel for $15 (cash only) a day, you can hop-on, hop-off at different stops along the Spit of Homer. Thank you for choosing the Best Western Bidarka Inn. We look forward to serving you upon your return to Homer. "Great breakfast. Property still allows smoking in some rooms, in 2018..."
Stayed here for two nights while on our DIY Alaskan road trip with my sister. The overall experience was okay, and I'd probably stay here again if in Homer, as it was cheaper than a lot of the other places in town. Location: This is nowhere near the Homer Spit, if that's what you're looking for. This is right off the highway and almost out of town. You will need to have a car if you plan on exploring Homer. Staff: Hit or miss. The girl checking us in was unfriendly. Not rude, but I wouldn't exactly call the experience pleasant - usually we're greeted with a smile, but not this time. On the other hand, the young man working in the mornings at the desk was friendly, as well as the breakfast staff - every staff member was awesome, especially the woman making the omelettes. Rooms: Some of the rooms are inward facing, as a regular hotel, and others are the old motel-style. We had a motel-style room on the upper floor, which meant we had to haul our luggage up the outside steps. This is not fun in pouring rain. Our room was fine - we were placed in a non-smoking wing, but there are plenty of smoking rooms here. Not to mention, lots of guests seemed to enjoy loitering outside their rooms smoking cigarettes. We had to walk through all of that nasty smoke just to get to our room. It's 2018 - enough with the indoor smoking! That's disgusting. Anyway, our room was clean, and everything worked. There is no AC in the rooms. Fitness Center: You have to get a giant key from the front desk to access the creepy fitness center. It's located in the basement in an unused wing of the hotel building. It's odd and gave off a creepy vibe. The equipment was decent though. Breakfast: A cut above most Best Westerns...this is located in the top floor of the hotel, in the "Glacier View" room (and yes, there is a glacier view, provided it's not shrouded in clouds!) - plenty of seating and giant windows to enjoy the view. Good selection and custom-made omelets, if you'd like. There also is a bar and pool hall located on the property but we didn't use either. Some unsavory characters hanging around outside the pool hall every time I had to walk by. Thank you for choosing us. We only have a couple smoking rooms left in our hotel. We have been steadily removing them and will be moving toward being a completely non smoking property. 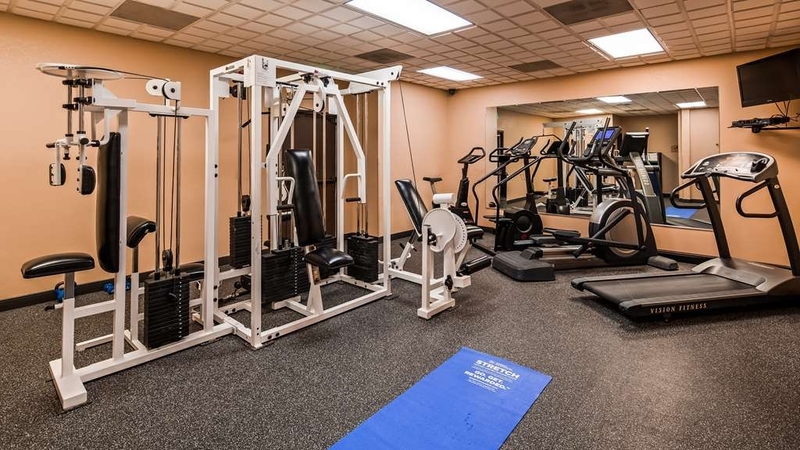 Our fitness center is located down stairs by our meeting rooms. This wing of the hotel is used and maintained on a regular basis. We are glad you enjoyed your room and breakfast and hope you enjoyed your visit to Homer. "Definitely would stay here again!" This Best Western was the last hotel on our week-long pre-cruise land tour! Located outside The Spit in Homer, a local trolley picks-up and drops-off at the door. The trolley fee is $15 per day, unlimited rides. After our long trip with some unpleasant hotel experiences, this two story hotel offered us friendly, helpful people: a maintenance man heard my wife rhetorically wondering about the day's weather-he stopped what he was doing, pulled out his cell phone and looked it up for her-unexpected and totally on his own initiative. At the check-in desk, each person we talked with offered suggestions on places to visit on The Spit, other local attractions, etc. When I expressed my concern about my wife's injured knee and her possibly not being able to climb the stairs to the breakfast area, they immediately offered to set up a table for us in the downstairs coffee room and to bring her meal down to her even though breakfast was a serve yourself buffet! Thankfully, she was able to climb the steps. There, the breakfast was tasty and hot. A chef prepared omelets to order. At the conclusion of the service time, he thanked everyone for eating with them and ordering an omelet as their doing so gave him job security. We accidentally left a package on the trolley. We talked with the desk clerk who, bfoe we offered it, asked for our name and address so they could mail it to us if it showed up. Believing we had left it in a restaurant on The Spit, a server in the breakfast area looked up the phone number and hours for the restaurant so we could call and ask! Totally on her own initiative! Later that morning, our tour director, Mike, came to us saying he had our package. The trolley driver, a 70+ man who drives a school bus in the winter, found it and brought it to the hotel. The hotel people got it to our tour director as we had not yet told them of our loss. This driver has been driving a school bus in Homer for decades. He now drives children of his former riders! These folks were determined to take care of us!! Our room was spacious with two beds and a nice size bathroom. Breakfast was included (the only hotel on this trip that did so). Great place! Be sure to ask for the main building as there is a second building a little distance from the main complex. Not far, but not as handy as being in the main building. Our only criticism is there should be an elevator for each building as the office/breakfast/meeting area is a separate building. Thank you for staying with us at the Best Western Bidarka Inn. The staff and I enjoy making each stay enjoyable and memorable one. 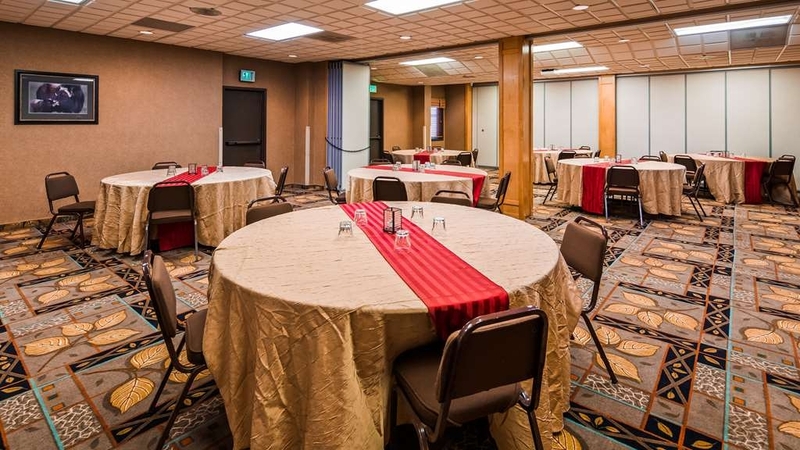 From clean rooms or simply a helping hand with local events or unplanned issues that arise. We are glad you enjoyed your visit to Homer and look forward to serving you on a return trip. "Don't Stay if you are Sensitive to Odors"
We checked in on a Friday afternoon. Check in went smoothly. Our room was on a non-smoking wing on the second floor. It was located off of an interior hall. The minute I walked in the room I noticed an old smoke smell. It didn't smell like it was recently smoked in. Either the room was originally a smoking room or there was a smoking room below it. Perhaps the carpet or curtains need replacing. It wasn't overwhelming, but I was always aware of the smell. The room was clean with white sheets and covers. It was warm and the windows were open the entire time we stayed there. There was a small table fan which helped circulate the air in the room. I carry a small bottle of air freshener which helped make the room tolerable. The bathroom had recently been updated with new floor tile and counter tops. The update did not include raising the sink to a higher level. It's still set at the level of sinks from the 50's. The sink is very low. We had a single Queen bed because that was all we needed. The Wifi worked well and there were plenty of channels on the tv. Breakfast was fine and check-out was speedy. Other than a bit of a stinky room it was fine. Thank you for staying with us. We checked the room in question and couldn't find any smell of smoke. That being said some are way more sensitive to smoke than others. It could have been smoked in years ago and that would be what you were sensitive to. We do use essential oil air freshener in our rooms so that we have the least amount of chemical smells in the room as possible. I am Sorry that you were inconvenienced and hope that you enjoyed the rest of your stay. Check in was easy and the receptionist was very helpful. We enjoyed going to the onsite bar before going out to dinner. Excellent restaurants nearby and the Spit is 10 to 15 minutes away. Very good breakfast with an omelet bar.The room was clean and comfortable, however, the noise from the adjacent rooms and especially from the room above was intolerable. The noise in the room above was almost non-stop and kept us from getting a reasonably good night's sleep during our three night stay. If you stay at this hotel be sure to get a room on the second floor. I am sorry to hear you had noisy guest above you. Please contact the front desk in this situation so we can notify the guests above you or possibly move you if we have another room available. I hope the rest of your stay was an enjoyable and hope that we will have another chance to provide you with a more restful stay. "A comfy place to stay in Homer"
We spent two night in this Inn as part of a tour and I was very impressed. Although as a family of 5 we hadn't have two rooms. The rooms were spacious and comfortable but a little bit dark in terms of lighting. There is a guest laundry which is great when you are on the road. The staff were all very friendly and helpful and the breakfast was one of the best we experienced on the mainland in Alaska. Lots of options and plenty for our children, who can be very picky when it comes to breakfast. There is a trolley bus that picks up from near reception that runs on the hour to take you down to Homer spit, so even though you are quite far out there are options for people that don't have a vehicle. Thank you for visiting us here at the Best Western Bidarka Inn. I am glad you enjoyed your stay and were able to enjoy our beautiful town of Homer. We hope to see you again on your return trip to Alaska. Thanks again. "A funny smell...a grouchy desk clerk"
We had one night in Homer. We had fun in the town but this hotel had a funky smell. Also the desk clerk who checked us in wasn't friendly. The woman who ran the breakfast was friendly and nice. The view in the dining room was beautiful. I am sorry that your experience with us was not the best. Could you provide me with the room number and the name of the attendant so that I can look into correcting the issues you have brought to our attention? Thank you for your feedback and we hope to have another chance to make your stay a good one in the future. First 2 nights in Homer, AK as part of Alaskan land tour after departing Norwegian Jewel cruise of Inside Passage. Homer is a very neat little fishing village. The Best Western Bidarka Inn is comfortable and clean. It has a great little bar and restaurant. The rooms are large and spacious. I highly recommend this place. The complimentary breakfast was delicious with a great selection to choose from with a great view. Thank you for staying with us at the Best Western Bidarka Inn. We hope you had a wonderful time during your stay in Homer. Stayed here for two nights and it was very comfortable. Large room with two double beds, fridge, TV set, microwave, coffee and tea making facilities but no aircon. Very quiet at night, good sound isolation, we had a good sleep. Bathroom with shower in bath and good water pressure, necessary amenities available. Breakfast was the best of all BW hotels we visited on this tour. They had a yogurt dispenser machine which was very hygienic (saw it when was opened to refill), also full american available. About 10 km (7 miles) walking to the Spit but there are lot other restaurants very nearby. Can highly recommend this hotel. We had a nice room and enjoyed our one night stay but be aware that there is no elevator and no AC. However, staff offered to bring our luggage to the room if we did not want to carry it up one flight of stairs and fans were available in rooms and windows did open if desired. The breakfast buffet was exceptional with fresh omelets available! We were in the main building and were satisfied with the experience. Honestly, after being in Homer for a few days and driving around, this motel is probably one of the better ones. The rooms are old but at least clean. The curtains were not good for keeping the daylight out!! The free breakfast each morning needs lots of work!! Not good and the personnel they have there need to be retrained on how to restock when things are empty! The man making omelettes was rude and should not be doing it! Overall, it was okay but I would research further for some place else to stay next time. Stayed two nights while waiting for ferry. Very comfortable, clean room. Large room was what we needed for rest. There was no air conditioning, but the windows opened and a fan was provided in every room for those that needed it. Excellent free breakfast with many hot items and fruit. Cynthia and Frances were very helpful getting us transportation and information. 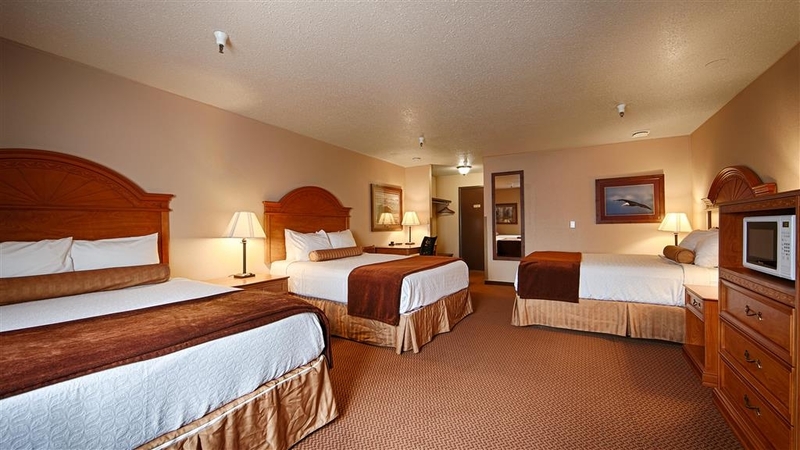 "Good location close to shopping and restaurants "
We chose Best Western because we wanted to be close to Homer Sea Plane Base and Homer airport. We walked to AJ's Steakhouse for dinner. Our room was spacious for two, clean and well equipped. There was a faint odor possibly from pet use prior to our occupancy. The breakfast was excellent. Room was good. We had a room that had a four person hot tub in it. It was great! Room was clean. There was very little room where the toilet/bathtub was as in if there was a full roll of toilet paper on you couldn't put the lid to the toilet down. Also, since access to rooms is outside (much like a motel) we could hear lots of loud noises as people were rolling their bags along the wood deck. The breakfast was normal - make your own waffles, eggs, sausage/bacon, oatmeal, yogurt, breads and pastries, fruit, cereal and juices. Staff was friendly. ALSO, there are no elevators to access 2nd floor rooms or the breakfast room which is on the second floor. Would stay here again. We booked room 131 which had 3 comfortable queen beds on the first floor. There was a complimentary breakfast from 5:30-9:00 which was very convenient for people who had to catch a fishing charter by 6:30. The motel was located within walking distance of Fat Olives, a good restaurant and a short drive to AJ's Steakhouse which also serves excellent fish. Whenever we go to Homer, our first choice is this motel. "Breakfast and view was awesome"
Staff was great! We arrived a little before the 4 pm check in and they accommodated us. We were put into the annex building in the back, 2nd floor and had a decent view of the bay. 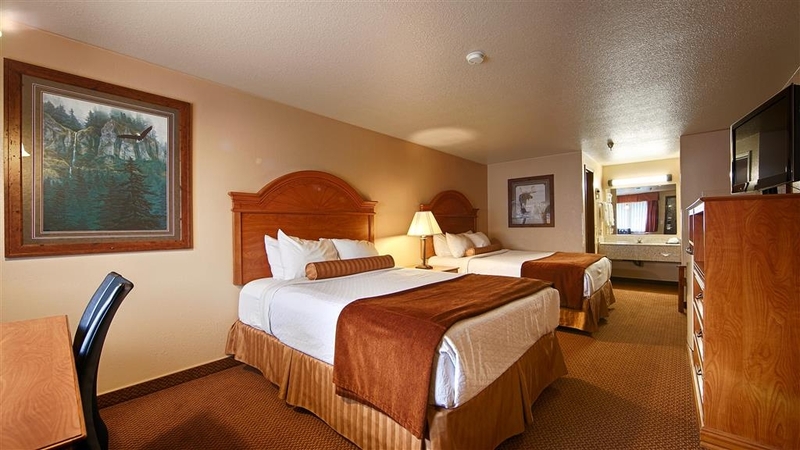 The room was comfortable, clean, looks like it was updated recently, and DID NOT have any noticeable smell of smokers. Desk had USB ports to recharge personal devices (phones). Beds were comfortable. The breakfast was very good. 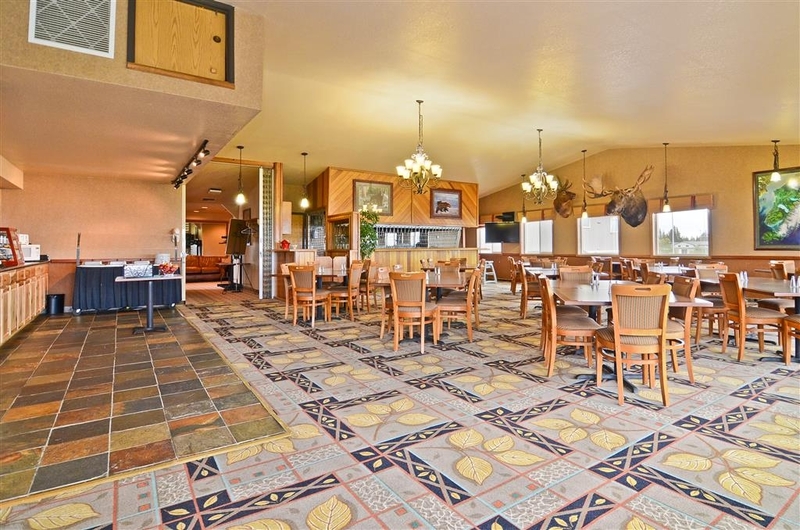 Hot buffet (Eggs, ham or sausage, pancakes or french toast) served with standard dishware and silverware. Coffee was good. Views of the bay were very good, and we were able to see a bald eagle fly by the window (about 20 feet away) as it was being chased by a raven. Laundry equipment worked well and seemed to be well maintained. Hotel is a little pricey, but the breakfast and view make it worthwhile. 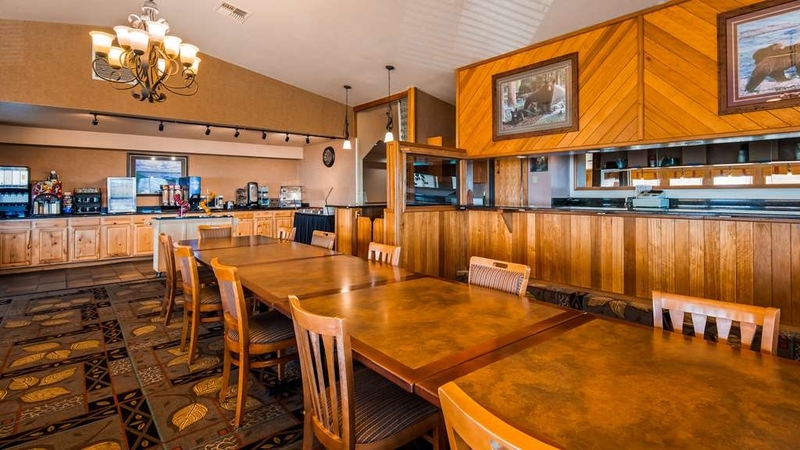 "Best Western Bidarka Inn Homer,AK." Clean rooms and friendly staff. Would stay there again. A good location situated near all amenities like shopping, dining, tourism, places of interest and artsy stores. I was here for work out on the Homer spit and this location gave me a close drive and yet quiet atmosphere. The Best Western Birdaka Inn is centrally located to beaches and numerous restaurants. They also have a restaurant on site. It is pet friendly, which is hard to find. Breakfast was included which is always a plus. Room was clean and bed was comfortable. Homer is a fun beach/fishing town with quaint shops and lots of restaurants. We enjoyed our time there. Great Experience. The Staff were very cordial and professional. The room was very clean and comfortable. I stay there several times a year and have never had a bad experience. Homer is a very beautiful city and there is lots to do. "Good location, value and free hot breakfast"
The BW Bidarka Inn is in a good location in Homer. It is a a good value for the price, which includes an all you can eat hot breakfast bar. The breakfast bar includes scrambled eggs, potatoes, corned beef hash, and waffles with syrup. There are muffins and bagels, coffee, tea, and juice. Canned fruit is also provided. This place is very popular with tour groups. The rooms are comfortable and clean. There is noise when people talk when walking by the room. Helpful and friendly. I really like the breakfast. The room was clean and updated. This is the second time we have stayed at the BW in Homer. The people were very nice. Excellent value for our stay in Homer. Staff was friendly and the breakfast was surprisingly good. More choices than normal. Fortunately it was off season rates but still more than I wanted to pay for that room. It was a bit small and cramped but clean. The walls and ceilings were thin and you could hear everything. Just hope you get some quiet neighbors that want to sleep in. We stayed here for 2 nights. The hotel is clean, comfortable, has a buffet breakfast, is easy to find. A very nice option for those who are going to be out and exploring, not sitting in a hotel room. The breakfast buffet was fine...they kept running out of the hot food items which was a little tricky as we were on a tight schedule. The front desk staff was friendly. There is a bar/restaurant on site. "Very Clean & Comfortable Great Value!!" We stayed 2 nights as part of a group tour in Alaska. The room was very comfortable and walking distance to some great restaurants. The best was the breakfast room that had a great view of the bay and breakfast was included with a lot of variety. Included breakfasts are very rare in Alaska! Our local guide was very impressed!! Great location just minutes from the day. Rooms were very clean and well done. Internet was excellent the whole time. Their breakfast had everything you could want or need and the staff was super friendly. Very clean and excellent staff. Very family friendly with large rooms and good breakfast buffet. Staff ready to help with any request. Granddaughters loved the room and the chance to "go out" for breakfast! Nice room, we got a room with a hot tub, the room was very humid due to the hot tub but it was a good time. The hotel lounge/restaurant was full of a bunch of local foul mouthed drunks, not a good family environment. Ok, so this hotel was ok for one night. It is an older hotel and could use updating. That said, there are not a lot of staying options in Homer, so that to be considered. The room we had just smelled old, so much so that we actually went to the store and bought Febreeze to freshen it up a bit. The bathroom was tiny. We were not impressed overall, but like I said it worked for one night. Staff was friendly and helpful. I spent five nights at the Bidarka Inn in mid-September. The staff was friendly, from the maintenance guys to the housekeepers to the front desk staff. Everyone was willing to answer my many questions about Homer, and they did it with a smile on their faces. The room was comfortable and quiet, even though I was facing the highway and near the bar. The soundproofing on my room was excellent and I never woke up due to outside noise. Very clean room and the staff keeps the grounds clean as well. I'll definitely stay here again the next time I'm in Homer! We frequently stay at Best Western properties and usually find them to be quite nice. This visit was no exception. We had a nice large room with a better than average breakfast included. The property appears to be a little older (1970's?) but has been updated. Our room had a completely new bathroom and bed among other furnishings. We had a room in the building with the lobby and my guess is that they've probably added on over time. Even being close to the lobby, the room was quiet and we did not hear people in the hall. The huge breakfast room used to be a restaurant with bar, so it holds a lot of people, not the usually cramped quarters for most hotels. There is also a separate restaurant and lounge as part of the hotel. I think the BW and the hotel at the end of the spit are probably the biggest and nicest in town, but the BW is well located, near restaurants, the beach and the visitor center. Large, clean room with delicious Free Breakfast in the Glacier Viewing Room. The staff is friendly and knowledgeable about the area. The Hop On, Hop Off Trolley stops at the hotel, which makes it convenient to sightsee and travel to the Homer Spit. The staff was friendly, and the room was clean, the parking was great, there was room for my truck and trailer. The food at the bar and grill was good, so was the breakfast. 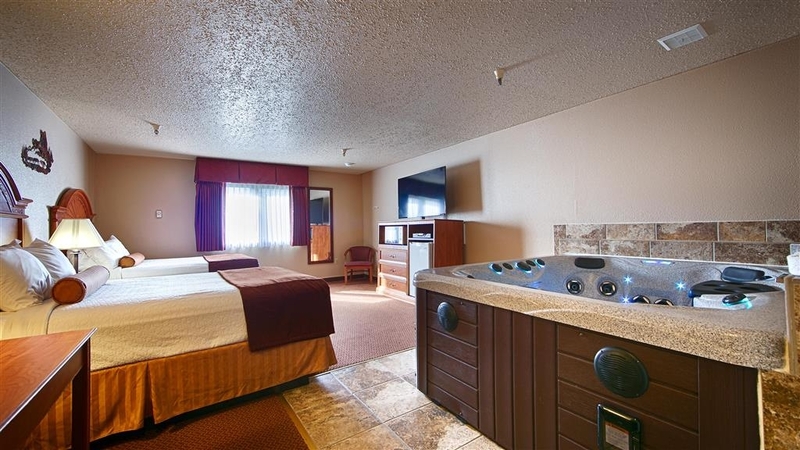 Rented a room with a hot tub and it was nice to have but was not worth the extra money on top of a spendy room. Yes this is a chain but the room was large, clean and functional with breakfast and coffee included. Due to the rainy weather we spent more time in the room than originally planned and glad we chose to stay at the Bidarka Inn. Enjoyed our room and the breakfast available each morning although there are wonderful breakfast places serving a better fare close by like Mikes and Wild Honey. You could walk to other restaurants for dinner like Fat Olives, AJ, and Cupcakes. We went to Alice's Champagne Palace a great local place that has music in evening very walkable in town. "Great continental breakfast and nice location"
We stayed two nights at this Best western. A cute 2 story place. We enjoyed it very much. Our tour bus dropped us off and had plenty of room to park and unload. The breakfast was awesome, huge room and plenty to eat. They had 3 washers and dryers so we snuck in a load of wash. Rooms were nice, we went in August but no A/c so we just opened the window. This BW was in a nice location where you could walk down the road to a couple great restaurants. Also the hotel had a nice restaurant and we ate there one nite very nice, as well as a bar. Great place to stay in Homer, AK. Staff is extremely friendly, caring and they take care of you. We've stayed here everytime we're in Homer and wouldn't consider staying anywhere else. Location is good and breakfast is prepared fresh daily. This is a best western hotel. it is a 2 story hotel. The rooms were very clean and the beds comfortable. There is free breakfast in the morning but it is upstairs with no elevastor to access it for my friend who was in a wheelchair. There is also a restaurant onsite and a laundry facility. This motel was a good locating, easy to find. Our room had two comfortable queen size beds. with plenty of room to move about. They served a full breakfast. good machines in the laundry. From the outside it looks like a typical motel, but the rooms were attractive and comfortable inside. Service was good. Parking easy One thing nice about staying at a BW is the quality is consistent. You never have to worry about your accommodations. When you arrive at the hotel, it appears that the rooms are facing the bay. When you walk in into your first floor room - your view opens onto the overgrown backyard with some trash and leftovers of building materials, and the daylight is permanently obstructed, so the room is always dark. The room is clean, and everything works, and it was cleaned well and promptly. The front desk lady during our check-in was pretty abrupt and not interested, she even directed part of our group to the wrong part of the building, and it took them a lot of frustration to find their room. Breakfast is poor in selection, quality and service. We have stayed in many Best Westerns, and this one is just Western, and clearly not the Best, unfortunately this area has too few choices. Great location just off the Spit and near downtown. Ease of service makes for a nice place to stay. Comfortable beds. Breakfast is served and it is decent. Staff are always helpful and readily present even at 4:30 in the morning. Clean motel, but had a soap dispenser in shower that leaked everything out down the wall. Beds were firm and uncomfortable. Same with pillows, too hard. Breakfast was ok. Everything else was as expected with a best western, clean and decent. Price was too high for the quality however. "They don't honor requests even five months ahead of time." I am sorry for the inconvenience. I checked your reservation you made in February of this year and the one from last year as well and I didn't see a request for ground floor on either of those reservations. When you arrived to check in we were unfortunately full and could not move you to a bottom floor. When booking make sure to have your request put in the reservation so that you will get a bottom room floor as July is our busiest month. I hope you enjoyed your trip to beautiful homer and hope you will give us another chance to make your stay enjoyable. Staff was friendly and accommodating, the breakfast was good - varied and hot. The rooms and beds were fine. Would have liked full blackout shades, and had to sleep with the windows open due to the heated floors. I would stay here again in lieu of a "proven" bed and breakfast option. We were a group of 7 and booked 2 rooms with 2 queens per room. It is conveniently located a mile off the spit. It was a standard Best Western hotel experience. Medium size room, clean and fresh towels and sheets, comfortable bed, nice breakfast. Typically, I do not stay at hotels, so this colors this review. Staff at the front desk always friendly and helpful. Rooms are fairly clean for a hotel room. We have had issues with rooms being extremely cold and then extremely hot, no in-between. Hair dryers must be requested, not located in room. Breakfast is bland and overcooked. Best eating elsewhere. The bar associated with hotel is always an interesting experience with acceptable food and interesting characters. i was very pleased with the overall size of the room. were much larger than other best western hotels and was surprised that there was 3 queen size beds in the room with a 60" Samsung television. Bathroom was a little small but was fine for the one night we were there. "2 days of our vacation "
Stayed 2 nights while visiting Homer. A very clean and quiet stay. Very good hot complimentary breakfast with an amazing view!! Parking was good. Great price not far off the Spit. Bonus of mama moose and her 2 babies running thru the parking lot!! Clean rooms, good hot breakfast, helpful staff, fast internet and walking distance to the best section of the Homer beach. At low tide, you can explore the rocks and tidepools for sea anemones and starfish (what's left of them). We only stayed one night at the Bidarka Inn, but during our stay we found the staff to be both friendly and welcoming. In season the hotel is expensive, but where in Alaska isn`t. The room was spacious and very clean. The king sized bed was very comfortable as is usual at Best Western Hotels. We had a nice view from our room also. We didn`t use the microwave oven but it was a nice touch, and the free Wi-Fi was very useful. Breakfast was very good with lots of choice, both hot and cold. I would recommend this hotel to others .......it has ample parking space, and is not too far from downtown Homer and the Spit. "Comfortable hotel with great breakfast." I was lucky to have an extremely helpful lady on the phone when I was making my reservation. The lady checking me in gave me the wrong room number, but was so polite and apologetic when fixing the minor error, that I didn't even mind. I got a room with 3 queen beds so my entire family group could stay in the same room and I was satisfied with the price. Finally, the free continental breakfast was great with several options and an amazing view. Great experience. My sister is already planning to return with her family! Nice hotel. Update rooms close to town. Front desk very friendly. Maids very nice. Rooms very quiet. Would recommend. It is pricey but everything in Alaska is. Would recommend Free breakfast average meal. Great place to stay in Homer. Affordable on the off-season, easy access, great complimentary breakfast on the 2nd floor of the lobby. No views from the rooms. 2 story motel. Lots of smokers outside their rooms on the first floor. Rooms are clean and comfortable. The soap and shampoo are in pump containers attached to the wall. If you can't afford the Lands End at the end of The Spit, this is a great second choice. Go to homer frequently for halibut fishing. Other hotels/motels are pricy and charge for amenities that bidarka already offers. Beds were comtrable, rooms clean, each room has an oscaltating fan. 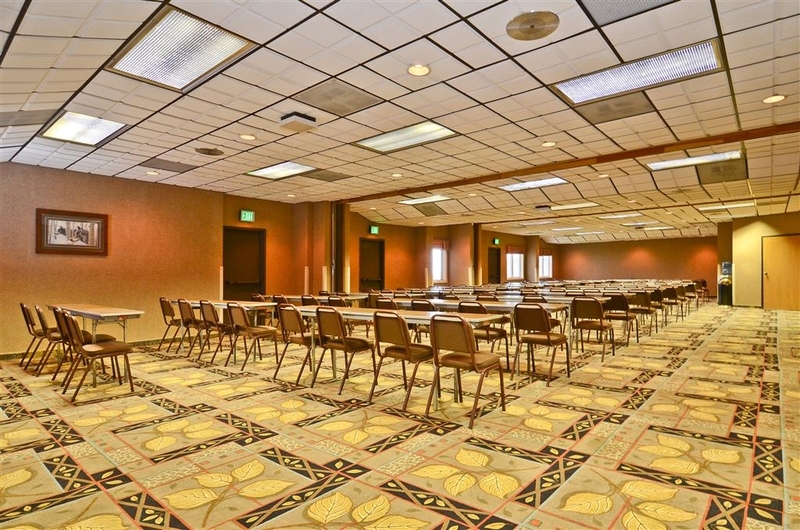 If your not accustomed with Alaska weather and temperature, these rooms can get very warm for you. This is always my first choice not only in Alaska but abroad. Always a pleasant experience. Most of my work is reactive with not a lot of planning and they have always come up with rooms for me and my crews. "Rooms with a view (of construction debris and brush)"
It is the most beautiful and best hotel in town. excellent service. Delicious breakfast. Recommended adding beef or chicken meat instead of pork and ham.very clean and people very helpful at front desk. "Clean and affordable and the only name brand in town"
For a town with about 5K population, this is your best bet for hotels. I would have given it 4 stars except for just a couple of glitches I will cover below. Room. Clean, large rooms...I had 2 queens, a medium size frig, a large flat screen. Not a lot of noise. Card Key entry (not swipe but tap). The bathroom was decent. A wall/floor heater is built in the bathroom for those cold Alaskan nights to warm you when taking a shower. I really like the 'dispenser' style shampoo, lotion, and body wash. This eliminates those small bottles of these products. Front Desk. Great front desk staff. I did arrive at noon earlier than check in though housekeeping was not done cleaning. No big deal. Every interaction I had was positive and they tried their best providing the best customer service. WIFI. Strong in the room and the large breakfast area. One will appreciate this as a visitor: my cell coverage only has voice and msg: no data. There is also a cable internet connection in the room which came in handy as my employer does not allow wireless for security (or some lame reason). Breakfast. The large dining area is a bit dated but the views of the snow capped mountain was great. Large selection of drinks, breads, hot meat items. Though I only had cereal, fruits, and juices...I'm pretty sure the meat items were cooked from scratch not just heated. Parking. Plenty of free parking outside. Location. Considering Homer is small, as this was not at the 'central/downtown' area, a rental car would be convenient. Although, a mere 5 minute walk are a few restaurants, a credit union, and 2 churches. So for the 2 items I think can be improved: - the milk tasted funny. Having been in the food service industry in the past, this can easily be avoided. Milk is a major breakfast item. Running out or having bad milk can be a big deal. This is a management issue. Proper labeling, ensuring proper temperature storage of food, quality assurance, and 'first in/first out' (FIFO) discipline should be part of a daily program. - housekeeping was slow. Most hotels I've stayed, they are done by around noon. This explained why when I checked in at around noon, the room was not ready. On my 1st full day, it was already close to 3pm and my room was not even done yet. As a business traveler I have mix feelings if I will return. I've done a great deal of traveling and it is rare that I stay at a Best Western. But given that this is the only 'brand name' hotel in town, one could try Bed and Breakfast. But for business travelers, B & B has some very steep restrictions. There are other hotels/inn in town but I heard they are pretty spartan. "Work brought me to Alaska"
Nice down home unassuming folks. Everyone I met was from somewhere else and super nice. Hotel was clean and comfortable with a hot complimentary breakfast daily. Glad for the Otter Room restaurant. It reminded me of Cheers! Everybody knows everybody!! "Great location- Not great views"
If you are looking for a good deal, with great complimentary breakfast this is for you. Good selection of hot and cold items, and the breakfast room has lovely scenery. The hotel itself is more of a motel layout, so if you are in the furthest building it is a bit of a walk to the main building. Easy access to town, but it is lacking some outdoor seating to really enjoy the fresh air in Homer. "JBS's Stay in Homer, Alaska"
Best Western Bidarka Inn located in Homer, Alaska provided a safe, clean and comfortable stay while I was in Homer for business. The location in Homer is on edge of the community and yet was very close to Safeway market and restaurants and other shops. The staff was great and did a fantastic job of accommodating our big group of kids and adults. Complimentary breakfast was better than expected and the view of Kachemak Bay from the dining area is spectacular. Dining area was also very clean and staff was friendly. Our room was clean, but dated. The door appeared to have been beat numerous times with a large hammer. Sink was faulty and shot water everywhere. The lounge/bar reeks of old fryer grease, stale cigarettes, rotting booze and something akin to a wet dog. Food was mediocre even for bar food. But, staff was friendly and efficient. This is not a getaway vacation place, but would be fine for a fishing trip or travelling with kids and pets. "Never a bad stay and never an unfriendly person"
The Badarka Inn is the only hotel that I've stayed at where I feel like I'm at home. It is very warm and inviting from the comfortable desk area to the comfortable breakfast room to the very comfortable king or queen rooms. "Terrible, loud, dingy and rude"
I had to move to a different hotel after one sleepless night at the Best Western - Bidarka Inn. The room was filthy, the carpet was old and a dingy dark brown. The bathroom was dirty and the coffee pot was broken and the cups had a coating of slime on them. The rooms are much smaller than they appear in the photos and they are run down and outdated. I could not sleep because the walls are paper thin and I could hear literally every word from the room next to me. I have never been in a hotel with such poor insulation between rooms - it was so loud that it was impossible to relax. The next morning, after I finally fell asleep from exhaustion, I was jolted awake by the sound of an extremely loud table saw that the hotel workers set up literally 4 feet from my door (see photos) there was also a lot of loud construction going on in the next room as workers were ripping out the bathroom, toilet and cabinets. This all took place early in the morning. I could not believe how unprofessional the staff was to do this to a paying guest. When I asked the front desk to do something about it, they said they could move me to another room.. they refused to even give me an apology nor would they tell the workers to stop construction. I decided to move to a different hotel because of how nasty the front desk was. They provided me with a fake number to the manager and refused to refund my money from the night before. This was the worst hotel experience ever! I would like to apologize for your bad nights sleep. Please call the front desk and let us know that the guests around you are being noisy and keeping you from sleeping. We have no way of knowing unless you tell us. We would then contact the guests that are being noisy and/or move you to another room. The maintenance staff started the table saw at 11 a.m. When you brought this to our attention we felt it best for your sake to be moved to a different room away from the room construction where you could rest in peace. We are in the process of improving some rooms to make sure they do not become run down and outdated. We use pre wrapped cups for our in room coffee for sanitary reasons and single use machines as well for the same reason. If it was not working for you we would have gladly brought you another one had we known. I promise I was not avoiding your call. I was on vacation with my family as it was spring break for our kids in Alaska and was not able to respond due to our being in a remote location. I hope that you will give us another chance to make your stay a comfortable one in the future. Extra large room with a very large screen TV in main building just down the hall from check in. The breakfast room was large and the menu featured both hot and cold treats. Since I was in the main building I didn't have to go outside to reach the breakfast room. We chose this Hotel because it was pet friendly. Not all Best Westerns are. It was close to everything. The front door was broken. They immediately moved us to a different room. The Otter room had good food. The complimentary breakfast was very good.Staff was friendly. Stayed here in early October for just the one night as a last minute thing. I probably wouldn't stay any longer but the beds are comfy & the rooms are large so there's no complaints with the overall stay we had. The rooms are a little out dated but still clean. I stayed here in July of 2016. This was a great hotel. I stayed in the building adjacent to the main hotel. The room was really comfortable. The bed was clean. The bathroom and sitting area was clean and comfortable too. The bathroom area looked a little older, but it has been maintained well. I had the the breakfast that was included with my room. It was actually pretty good. The views from the breakfast area overlooking the ocean are awesome. They have a workout room. You have to checkout a key in order to use the workout room. They were nice and gave me the key. Overall, I would recommend this hotel and stay there again. The staff was incredibly friendly. They served up a nice breakfast. The views from the breakfast room are spectacular. The room was clean and comfortable. The internet service worked well. I have no complaints whatsoever. The hotel overall was very good, but the restaurant was the highlight of the stay. Wonderful ambiance, food and service. Some of the best food we had on our trip to Alaska! A surprise for a hotel restaurant. Was visiting Homer & only stayed one night on 9/19/16. We had a room with two queen beds. Room was very clean & well appointed. If it matters to anyone, this inn does not have interior corridors & I really don't think any of the rooms (or very few) have views of the inlet. We had a room on the lower level & we could hear some footsteps from the floor above but it wasn't really objectionable (or maybe they were as tired as us & just went to sleep quickly). The full breakfast in the morning was fantastic! If anyone complains about the free breakfast then they are too fussy! It was towards the end of the season and our large king and queen bed room was only $120. That's quite rare to have that bed size combination and it was greatly appreciated. We had a partial of the mountains too. There was a refrigerator that actually kept everything cold, microwave and a small coffee maker. The beds were comfortable. The complimentary breakfast was good and was available for four hours which was wonderful. The internet was a bit spotty but i think that is true of this area. We were in room 252 which is in the main building and right by the breakfast area. My wife and I spent two nights while I recovered enough to drive back to Soldotna, The service, cleanliness and condition of the room was outstanding. During our stay I was unable to ascend the stairs for breakfast. The staff without being asked volunteered to bring breakfast to our room. Unexpected but appreciated kindness at a time of need. Thank you again. "It was a place to sleep"
It was a cruise ship day, so we were lucky to get a room anywhere. We were grateful to get one of their last rooms, even though it was a smoking room. The room reeked but we were provided with an air freshener. We knew what we were getting so we can't really complain. The room was pretty dated, but it was clean and the bed wasn't bad. No air conditioning which does not appear to be unusual in the older motels in Alaska. We could keep the screened window open without fear as we were on the second floor. Additionally, the room contained a fan to help cool things down. Breakfast was included. The view from the breakfast room was great. The food was not. I would look for different lodgings on returning to Homer. Stayed here 08/25/16 while in Homer for a fishing trip. Staff were very friendly and accommodating. Enjoyed our dinner at the restaurant and bar (try the halibut - fresh and very well cooked!). Good selection of beers on tap. Good location, and quite reasonably priced. I would stay here again, and would recommend to my friends. I enjoyed my stay at the Bidarka Inn, it was the perfect place for my fist time in Alaska! The view from the breakfast room is phenomenal and breakfast is very yummy! I would highly recommend staying at this property for your visit to Homer! 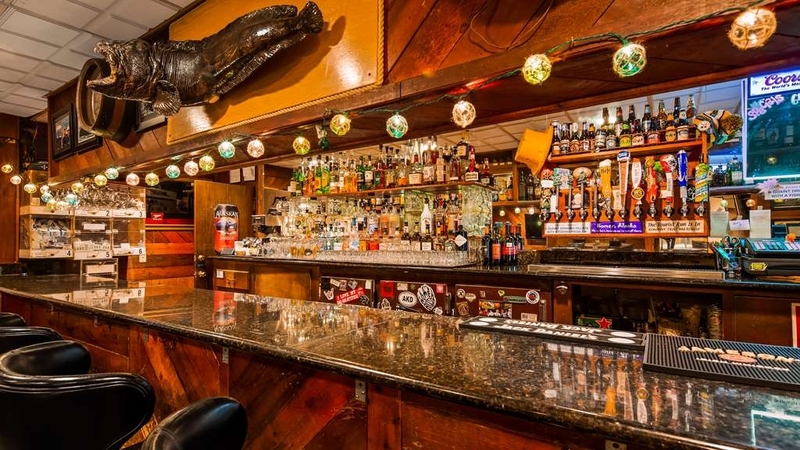 "Homer's Bidarka Inn - an excellent stay"
The BIdarka Inn, in Homer (Alaska), is an excellent place to lay your head down for an evening of well-deserved rest. It not only features fines rooms and facilities, but a good dining room, and evening amenities. It's location is handy to the main thoroughfare into and out of Homer. "Average hotel in a good location"
Conveniently located on the main road heading towards the Homer Spit. Rooms are clean, good size, comfortable, but my room had no view (just of trees against the window). I wasn't impressed by the website, but the hotel was a fine place to stay. The Birdaka Inn in Homer, Alaska was a very pleasant surprise. The rooms were big, clean, comfortable, up to date with coffee maker, microwave, refrigerator with freezer for your convenience. So close to everything: the Spit, galleries, restaurants, museums, etc. The full breakfast every day was hot and delicious with different options every day. The staff were friendly and accommodating. Would recommend to anyone! Thanks Birdaka! We hope to return some day! "Great, clean, comfortable place to Stay with a bonus"
The cost is expensive, at any place you can stay in or near Homer during tourist season. The Motel was very clean, spacious, comfortable and includes free full on breakfast with fresh hot coffee starting at 6 am. There's also a restaurant and bar attached so you can eat without the need to drive. A drive through this quaint small town and even out to the end of the spit can be round trip in under 30 minutes, but why hurry? 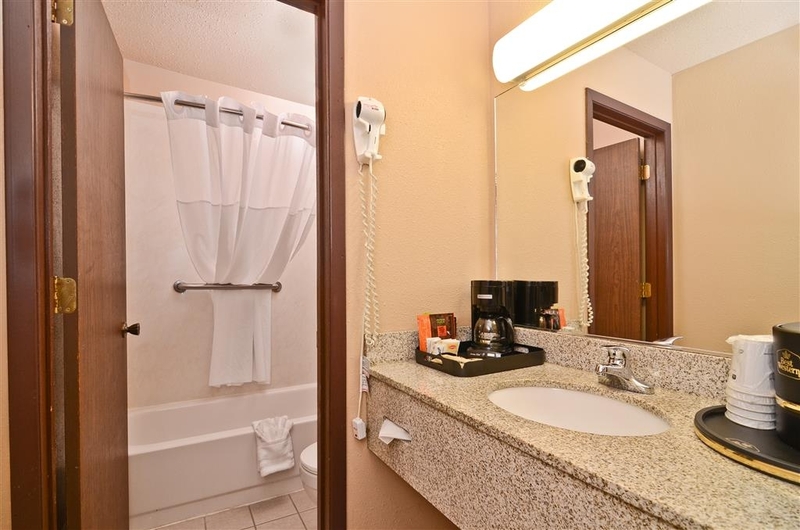 Stop and smell the roses as this Inn is conveniently located. "Summer Fun In Alaska, my home." Booked online and was a little nervous from pictures. Arrived for check in and found the motel to be better than pictures. Room was big and had all amenities except air conditioning. But its Alaska don't really need it. Fan was in room and opening a window will cool it down fast. Location was good right around corner from Pioneer Ave. main road for galleries and cafes. On road to Homer Spit and other attractions.Breakfast buffet best I had in Alaska. Met locals in Otter Bar on premises. Front desk staff were considerate and professional. Took time to answer all questions. great place to stay for you and your dogs. 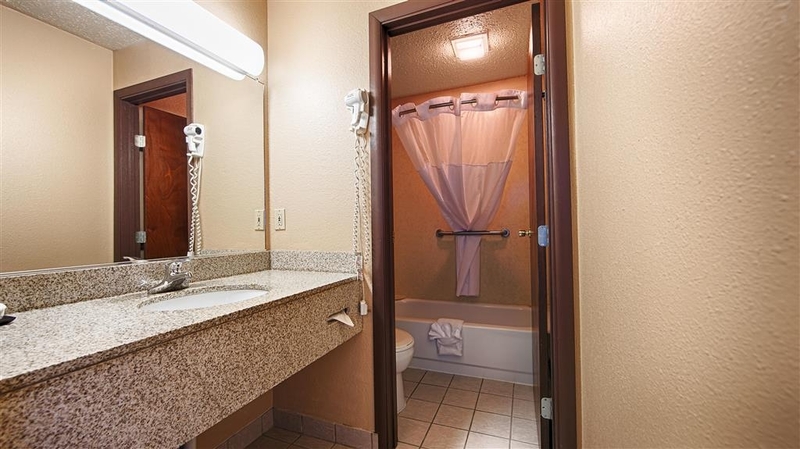 clean and has all you need for a great stay, Near great food and bakery. would recommend this hotel for anyone, Our dogs also recommend this hotel , they had lots of room to roam and find a nice warm place to sleep..
"Lots of Issues - Front Desk to Facility"
This is not an inexpensive place to stay - I would have thought it would be a better facility. I am a loyalty member but was not greeted or recognized. There were no amenities as there are in all the other Best Western hotels where I have stayed. The front desk person, Christine, was abrupt and unpleasant. When I asked her to repeat the information about the breakfast room location her voice indicated her displeasure. Another example: my tall husband was trying to get the cable for the Router to work - turns out the desk mounted outlet was dead - he was bent over the desk and then straightened up and the low hanging lamp was in the way. He broke the bulb in the fixture and burned his head. He let the broken bulb cool and then unscrewed it and took it to the office. Christine did not ask about his welfare - just accused him of doing something wrong. She asked, "Why did you touch the light bulb?" On to the facility: There is no elevator and there are lots of steep and some are non-standard height steps due to added tread material. The breakfast room is up two flights of steps. There is a tub dispenser for soap, shampoo and conditioner. The shampoo and conditioner are loaded in the wrong slots. The room was 77 degrees all the time even though the thermostat was set at 55. Thankfully there was an oscillating fan. The internet is not WiFi but requires a router - thankfully there was a cable to connect. The breakfast was not great - it is advertised as a 'full breakfast' but it is just the standard hot and cold offerings. The good things - there were two luggage racks. The room was mostly soundproof and the curtains were black out. There was a refrigerator with a freezer, a microwave, a coffee maker and a TV. The bed had a light blanket and an additional blanket (also decoration at the end of the bed). "Our first and last time at the Best Western in Homer"
We spent two nights at the Best Western and found the accommodations acceptable. The problems we had were twofold. First, there was a strong odor of natural gas in certain areas of our hotel (fortunately, not our room) and, while the food quality was what I expected at the breakfast buffet, the coffee was very bad. This hotel has lots of room for improvement. "Nice Compromise of Price, Quality and Convenience"
We stayed at Best Westerns in three cities in Alaska (Anchorage, Steward and Homer) as a compromise between quality and cost. This place was a bargain compared to other offerings. The breakfast was relatively good and the hotel is located on the main road into town. We had a handicapped accessible room which was configured a little differently, but okay. The room was relatively large. Room were very clean, slept 5 comfortably in a 2 bedroom suite. The full breakfast included in price for all guests was very good. Tight parking, but good location in town easy to find. Wifi was fast and easy to use. Bidarka Inn was an excellent place to stay, conveniently located off the main highway, and very affordable by Alaskan standards. The room was clean, good bathroom facilities, quiet, and good parking. My room was on the first floor...I believe there was no elevator on the second floor...make that request if reserve. The staff was friendly and knowledgable of the local area. What was especially great was the free breakfast, including hot scrambled eggs, breakfast meat and potatoes. 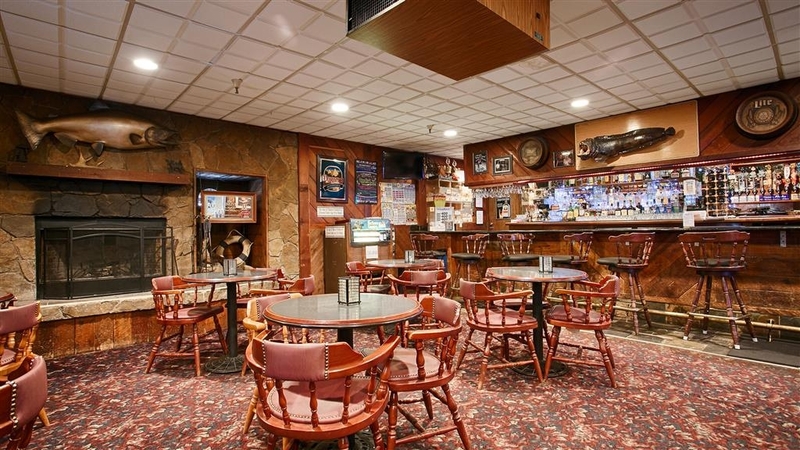 "Great location for Homer Alaska"
This is our 4th or 5th time at this location and we are always satisfied.. Staff and hotel are extremely welcoming...The breakfast buffet is wonderful and offers a lot of different choices. 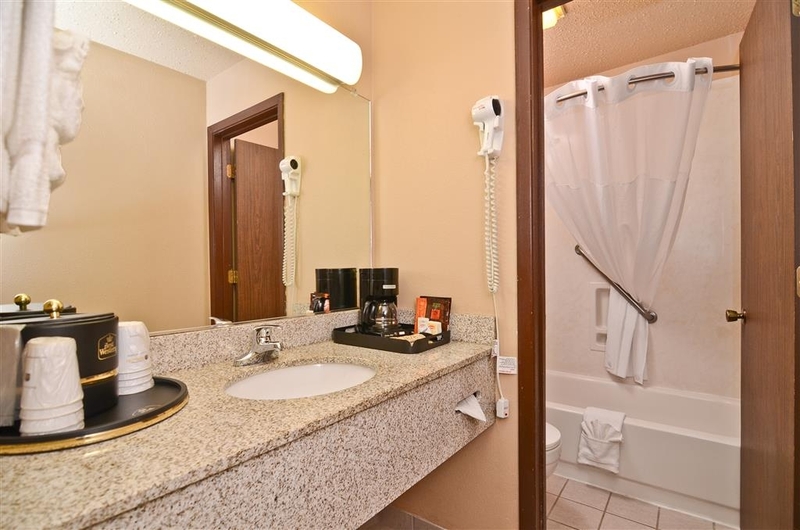 Rooms are clean and adequate for an enjoyable stay. "Pricey but a great place to stay"
Due to the price, I would not have considered if I had not had enough reward point to get a free room. However, there were not many option at this location. I am entering this sentence just to meet the requirements for a review of 200 or more characters. "Nice Stay in Homer with Great Breakfast"
We stayed for 4 nights and were very happy with this motel. We had a first floor room in the back building. It was very quiet, beds comfortable, spacious room. They have a sign you can leave out for when you want your room cleaned. I loved this feature, used it and it was honored. The breakfast was excellent. The hot food was actually cooked fresh by a cook and was very tasty. There were lots of toppings for the waffles. There are beautiful views from the breakfast room. There is a restaurant/bar on site but we did not visit. Staff was friendly and helpful. I had a problem with the internet one night and after about 1/2 on the phone with support, they got me back online. This is a very nice place to stay. Has a WONDERFUL breakfast in a room with a FANTASTIC view of Homer. Rooms are comfortable and clean. Staff friendly and helpful.Would definitely recommend this property. "Friendly helpful staff and a great breakfast"
Arriving at Homer airport on a cold evening we were grateful for the free shuttle service to the Best Western. Once there the hotel staff could not have been more friendly and helpful. 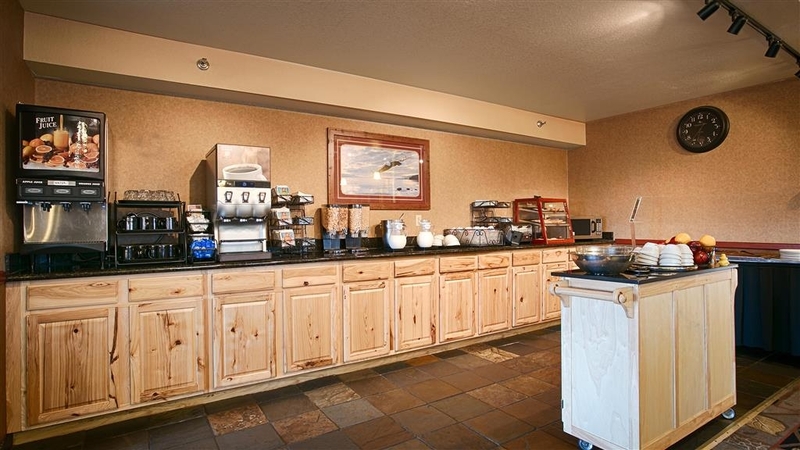 Laundry facilities plus an excellent breakfast made this a great choice for an overnight stay. Nice breakfast in the morning, clean rooms, equipped with wi fi I think, tv, etc. but if you are going to AK to unplug, you don't need it. Good for business travelers. Little pricey for a Best Western, but I guess it's due to location. "Good one for a short visit"
the hotel is located in the center of the city and everything is accessible from it. The rooms are nicely done and clean. They are equipped with the necessary things one need. It also offers free breakfast in the morning which turns to be really good. the only reason I gave 4 star is the view. Someone may come with the expectations that the hotel is closer to the bay/ocean and it will be the scenic view from the hotel but nothing is visible from here as the view is hidden by the trees. "Average Best Western; Good for Homer"
We stayed here for 2 nights as part of a land tour. Room was very clean but no air conditioning. You can open the window to get a nice breeze but if you're on the 1st floor you probably don't want to leave it open all night. They leave a card in your room to select the type of "cleaning" you want. We picked the "trash & towels only" and that's is literally all they do. The maid emptied the trash and picked up the towels but neglected to leave new towels or refill the Kleenex. When I called the Front Desk to get what was needed (no one answered the Housekeeping line), I had to walk to the office to get it which was kind of inconvenient. They have a complementary breakfast with your stay; food was good for typical breakfast items. The room was your average room for a Best Western. Good location, friendly staff, decent buffet breakfast. Motel is starting to show its age a bit and needs refreshing. On site restaurant is not that good and, IMO, not worth the prices in the limited menu. This BW room was too small for the two queen beds. Less than 18" to the wall on one side of the beds, makes for a tight squeeze getting in and out of bed. Could be hazardous at night. The restaurant offered only breakfast. Most of the food was appropriately prepared and presented, however the bacon was barely cooked--dangerous with pork products. We asked for well done bacon and were ignored. The desk clerk was very helpful on check out, answering travel and direction questions and offering tips. Associated bar was busy at night, and the hotel staff were busy trying to clean up the mess left outside (trash, cigarette butts, spilled alcohol) in the morning. Not sure that I think a bar in the middle of hotel property is appropriate location. It's available for everyone coming in off the streets, so that's what you get. My husband and I came here for superbowl sunday. When we came into the room it was freezing.. and after calling the office, they told us how to turn up the heat... and it warmed up in an hr or two. Being such a loud weekend, I wouldn't complain about the noise cause we didn't hear anything from any of the other rooms or the bar area which was nice. This is a good location for anyone going to Homer or Homer Spit. There are lot's of restaurants and great viewing places around here to see wildlife. The hotel has a nice restaurant for breakfast with a good view and nice choices. Probably the best place to stay in Homer. "Great value, great location, and really nice property!" Location, location, location!!! Right in town in the thick of things. About a block or two in any direction to the SeaLife Center, Resurrection Bay, shopping, restaurants. Very nice hotel with huge lobby area, very good breakfast, and clean, comfortable rooms. Staff is extremely friendly. Would definitely recommend this hotel and will stay there again on next visit. The room was very nice and large. It had a large TV and the shower worked well. The breakfast was very good. The only problem was the internet. It was very difficult to get a connection. I had to go to the lobby to get connected, then lost it when returning to my room. It was difficult to stay connected longer than 5 minutes. The hotel was lovely except for this. "Good Hotel to Stay in Homer"
This is probably the fanciest hotel in town but because Homer a way out of the way place with a short tourist season it would be only average if in a more populated area. Beds were great and rooms were clean. The free breakfast could use improvement in the hot food area. The lady at the front desk was super nice when we checked in, and equally nice when we checked out the following day. The room itself was adequate, but it was quite honestly the hottest room I have ever stayed in. This was Homer, AK. There was no way to control the temperature in the room, and that was a real problem. We tried opening the window but that did no good as far as creating more air flow. You could hear passing cars, and people talking loudly right outside the window. As others have mentioned, the hotel itself is loud. I can't imagine a quiet room anywhere. Hot and loud. I was only there one night, and I slept fairly well. If all you are doing is sleeping, this is fine. Breakfast the next day was fine, it was a standard buffet breakfast. There was coffee in the lobby but it was atrocious unless you put in tons of creamer and sugar. I'm not sure what that was all about. For future trips to Homer, I will look for a quiet place away from traffic noise, where I won't overheat, and where I can open the window without hearing the person next door screaming at their kids. People should be aware that there is no elevator for those with limited mobility. The dining room is on the second floor. I am not sure if this is a facility that allows pets; but felt room was either very stuffy or this had been a room with pet usage with slight odor. "Kachemak Bay Shore Bird Festival"
The Bidarka Inn was the perfect place to use as a "central hub" for all activities available in Homer, Alaska. The panoramic view from the breakfast room is breathtaking; what an inspiring way to start each morning! If staying at this hotel, recommend staying upstairs. There are only two levels. The walls are paper thin so noises from the parking lot and rooms around you will carry into the room easily. Highly unlikely that you will get a restful night in a room downstairs. "Comfortable, clean view of moose"
Comfortable, clean room with complementary breakfast, and an offer to have a lunch packed and ready for early morning departures for say a fishing or flying excursion. The breakfasts provided abundant filling choices, good amenities and location to all we needed and wanted to do in Homer. Clean and nice price range . Plus its the only name brand chain in Homer. Plenty of things to do because its in a great location. Bar and restaurant right on site . Plenty of free parking. New washer and dryers . The beds are very nice ,they must have been just replaced. Our family was hit with Spring Break fever in late March and took a trip from Anchorage to Homer(approx.3-4 easy driving) with our Dog, Lincoln. I'm a skeptical Father and there was no way in my mind that we would ever find lodging with him. Solution,,Best Western Bidarka Inn in Homer, Alaska. Pet friendly, really, nice stay, woke up to eagles bossing to get breakfast and an unforgettable view to converse and eat a nice breakfast. Get your reservation to this family friendly Inn, we stayed an extra night. 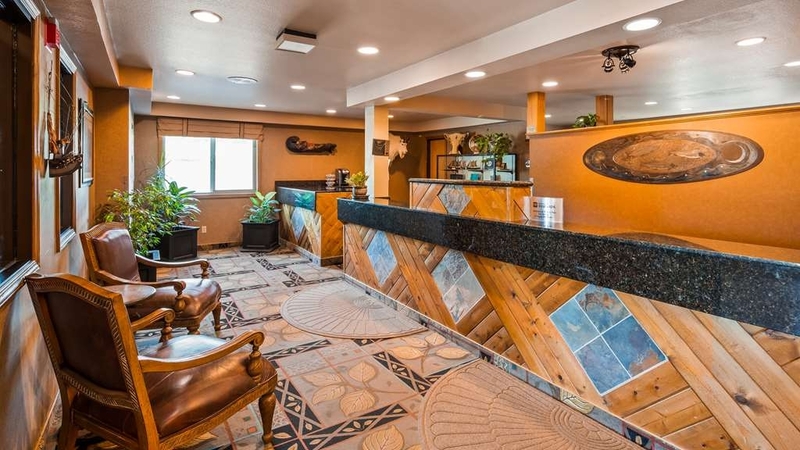 "Great Staff that provides excellent service"
If you are looking for a great place to stay or hold a meeting in Homer, look no further, the Best Western Bidarka Inn in Homer is a place where you will get a comfortable sleep and a Staff that is friendly and responsive. From the day we checked in, the entire staff went out of their way to accommodate our company. This hotel is everything you look for in a hotel, and I can't say enough great things about it. Our king room was huge and very comfortable. The ladies in the Otter Room were awesome, and the service staff took care of all of our business needs. The Best Western Bidarka Inn in Homer, Alaska, provides very good accommodations and an excellent buffet breakfast. The location and access to Homer activities is great, walking distance to shops, schools and churches. And easy access to the main road out to the Spit, Homer's premier feature. This was the best stay I've had in months! The beds were comfy, staff was outstanding, the breakfast was awesome! French toast, sausage, FRESHLY MADE WAFFLES! Yeah, next time I'm in Homer I'll be staying here again! The breakfast alone was worth choosing this hotel over the others, let alone the staff. My husband and I stayed at the Bidarka for almost 3 months, the people are awesome the service is great. I love the people here, they are very accommodating and will do anything to please you. The workers don't come any better than this. They deserve the praise as they are the ones that hold this place together. I would recommend them for long or short stays. for around $100 per night you get a decent stay here. If you have a family of 4 or 5 try to get the room with 3 beds in it. Ours had a mini fridge, microwave and a very nice tv. Rooms were a little dated but for the area it's what I expected. The continental breakfast is one of the best I've had. only missing the bisquits and gravy. Coffee could be better though. Overall it was a nice place to stay. This is where I would stay again unless I wanted to spend more for a hotel. This hotel has no sound barrier between the rooms and the outside. We stayed here two nights and the first night was loud but tolerable. The second night there was a party upstairs above us. You could hear every dirty word and tromping all night. They even peeled in and out of the parking lot. It was ridiculous. It finally stopped at 4 in the morning when I'm guessing they passed out. I would never stay at this hotel again. Forget this place if you have kids for sure. This hotel was very affordable in the off-season. 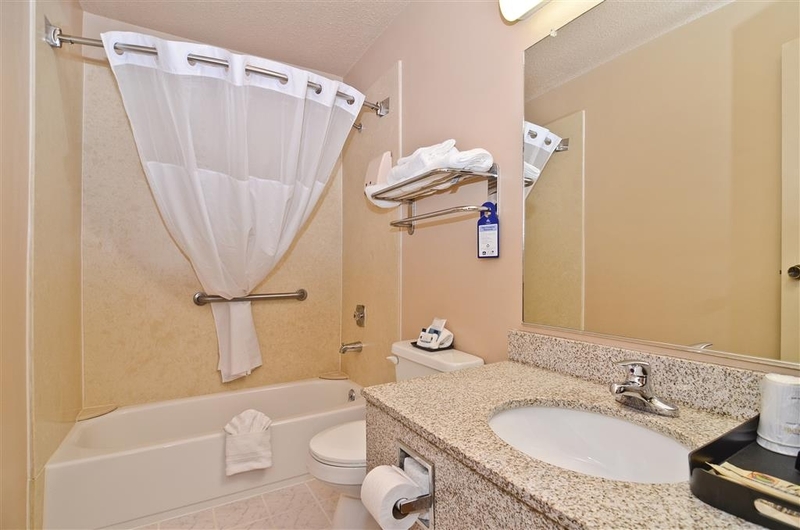 The room was clean, no frills (bathroom a little dated but clean) and most of all, the staff was friendly and welcoming. The rooms open to the outside, we had a ground level room so gettign to and from our car with kids was very convient Good breakfast! Room was very clean and everything worked, provide lots of towels (which I always love) and lots of coffee. Front desk staff are very helpful. Breakfast was in a nice big room with a good view of the bay. We chose Best Western In Homer, AK because of it's pet friendliness and reputation for value. The breakfasts are . awesome here, with a great variety of quality breakfast foods. The biscuit gravy was made from scratch. We ran accross a few maintinence issues, but our stay was still very comfortable. All the staff were down to earth, helpful, and knowledgeable about the area and especially the fishing info. "A great place to stay for business and pleasure"
Francis and the other ladies in the office, the maintenance crew and the gang in the Otter room are all awesome. The king room is very spacious and comfortable. The food in the Otter Room is delicious and the helpings huge. I was very pleased with the well equipped and maintained Building and Room. Great morning breakfast and very professional and friendly Staff! Enjoyed my stay and will go back to stay on my next stay. Thanks all!!! We were pleasantly surprised at the cleanliness of the hotel room, especially as a pet-friendly establishment. The hotel location was also great as stores and restaurants were extremely close. We had a nice stay and would definately come back in the future. My husband and I stayed at the Best Western and were totally pleased with our choice. The staff was always helpful and friendly when we needed something. We were upgraded to the kind of room I'd put in the notes during reservation (winter is not the busy season though). The breakfast choices were more extensive than a standard continental breakfast (including eggs, sausage, potatoes, etc.). The room with the electric fireplace and king-sized bed and a view was wonderful. They even provided a portable fan in the room, perfect for those of us who like background noise while sleeping! The motel is located in a convenient place for getting around Homer. Great place to stay! "Upgraded rooms are very nice"
I stayed here for a business trip. We were fortunate enough to stay in the upgraded/remodeled rooms in the hotel. My room was very clean with good wi-fi. They have a small but decent workout room in he main building too. If I had to stay at the Bidarka Best Western again, I would ask for the remodeled rooms. I haven't heard positive reviews about the older rooms. It was quiet and had plenty of parking. The hot breakfast was nice to have on site but the food at the Otter Room (bar/restaurant) was pretty underwhelming and somewhat overpriced. That's okay though, there are plenty of great restaurants in Homer to check out. Good ,clean, overnight stay. lots of parking. your standard Best Western property. The restaurant on-site is not part of the Best Western, although the same building. Avoid the restaurant. If you really need food go off site. there are a bunch of good restaurants IN THE TOWN. "Hot breakfast included, good sleep"
We were with Norwegian cruise tour, and stayed here as part of our land portion. No view, dated room and bath, just off the main road into town. But located near access to the beach, where one can witness spectacular sunrises and sunsets, take nice strolls along the beach, and can walk quite some distance seaward in low tide. Eagles sighted in the beach. Breakfast was good. Wi-Fi worked well too. "Worst hotel of our trip"
My wife and I have been traveling from the lower 48 to Alaska, and have been on the road for nine days. When getting to Homer to wait for our ferry we stayed at the Best Western in town hoping to have a relaxing night after a long trip. For what we paid for the room, that shouldn't be to much to ask for. The room was big with two queen beds, but we could hear EVERYTHING going on around us outside. From what sounded like people riding four wheelers through the parking lot half the night, and a group in the room below us slamming door, yelling, and either throwing things at the walls or just hitting them over and over again. This went on till after 1 am and then started again at 6 am, and then to top it off around 6:30 someone from the group started banging on our door yelling for a friend of theirs until realizing it was the wrong room. This entire trip I have had to be up at 5:30 am and get back on the road, the one time I have the opportunity to really sleep and I am surrounded by so many inconsiderate people makes me irate! "Previewing homes for sale in the area." Hotel was centrally located and clean. The staff was very helpful and kind. I would recommend this Hotel to anyone planning to stay in Homer Alaska. This is a very beautiful location with a stunning view from the breakfast area of the ocean. There are quite a few of hotels to choose from but I would recommend this one for sure. We saw Moose when we went in June 2015. "Pet-friendly hotel in Homer, Ak." The staff was very friendly and helpful. The room was clean and the beds comfortable. There were non-slip mats in the showers with grab bars. The internet access was good. The room was very quiet. We had a cat with us and it was our first time in a hotel with an animal. 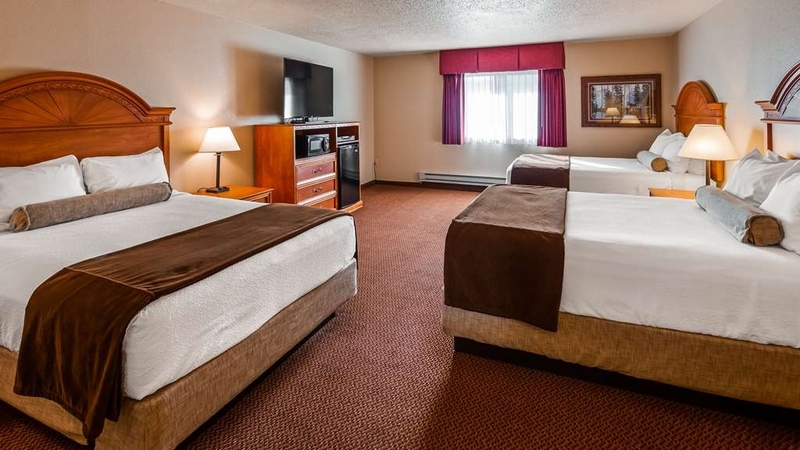 "Clean rooms, comfortable beds, pet friendly (but call first), and great staff!" If you are looking for a pet friendly hotel, this is it, but make sure that you call to make sure there is a pet-friendly room available. There are only so many of those rooms as not all the rooms are designated as pet-friendly. The staff is great, the rooms are clean, the beds are comfortable, and the property is well maintained. This was nicely situated, clean and quiet, and a perfect place to launch to whatever activities you decide to undertake in Homer. Although we went into town for meals, there were options onsite including a restaurant. Staff was friendly. Nothing was fancy but it was still more than simply "bed and board" and I would stay again. I felt it was a little pricey but then again, that's Alaska! When we pulled up, I thought UH-OH. It's not exactly charming outside and right on the main road. I was pleasantly surprised inside. Nothing special really but very clean and fresh and a good bed. The bathroom was adequate and the rooms were quite large. I had a view of mountains, water and several parking lots including an RV just under my window with a guy staying in it. They have a restaurant and bar of sorts that I was taken aback by initially but by day two (of two) we warmed to the Otter Room considerably. I ate a hamburger there and it was about what one expects from a hamburger. Relatively limited selections on food and beverage but what they had was OK. You will smell heavily of fried food after being in there though. Really oily smell. So - if you happen to be in Homer AK this is an OK place to stay. If I was to find this elsewhere, I might be less charitable. Alaska has a fairly rustic esthetic. My husband & stayed here one night has part of a five day land tour prior to our cruise. The room we got was large and beds were comfortable. Our room window opened and provided a fresh breeze and we liked the privacy the trees provided. It was great to have a sink area separate from the toilet and shower and makes it more efficient for two people to get ready in the morning. The breakfast was good and came with the room. With food so expensive in Alaska having breakfast included was welcomed. Homer is a laid back place and off the beaten path and this hotel fit in with the overall vibe of a fishing village. "Expedia - you work with Best Western to make it easier to stay here? Gross! The place is a dump!" Spare yourself. This place is a dump. If you want an expensive, smoky smelly room - choose this place. If you want zero customer service - choose this place. If you want to pay a lot for a horrible experience - choose this place. Believe me there are nice places to stay in Homer and this is NOT one of them. Run for your life! This would have been a one star, but they moved us out of our original room five minutes after arriving. We walked into the room and a smell of cooking oil and cheap food penetrated the room from the bar below. If that wasn't enough, apparently the oven vent runs through the second floor and shook the room, the base was pretty heavy so it was hard to hear anything over the vent. They did move us to the floor below (hence the two stars). The first night was okay, maybe 2.5 star worthy, but the second night consisted of us waking up every 20 minutes to the sound of drunkards yelling outside, upstairs, next door, and stomping throughout the building. I am grateful that we only paid $90 a night. A week prior, we would have been paying double, as Alaska's summer rates are ridiculous. If you've stayed in other Best Western chain hotels before and liked it, there should be no surprises here. Rooms were clean, beds comfortable, and there was no outside noise coming in. If you need a place to sleep in Homer, this is a good place. If you want a view, this isn't it. Rooms facing behind the hotel (95% of them do) face into wooded backyards - so all you see are leaves in the summer. This also causes an issue with natural light coming into the room - it was fairly dark even during the middle of the day. Its a good place to rest your head at night and have decent breakfast in the morning.